When I find myself out on the trail, I always run into the same problem. 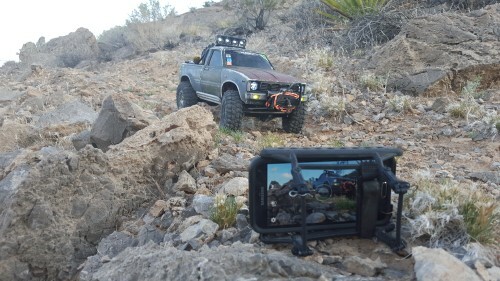 I use a Go Pro and a few other cameras, but like most people I also use my phone. The issue I run into is trying to take a pic or video with my phone and drive. 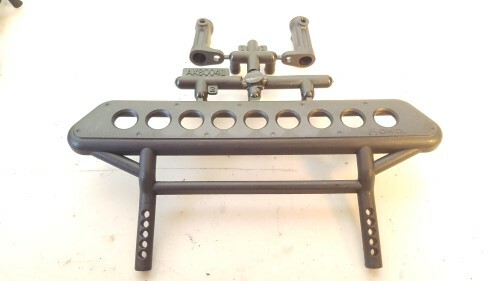 I have looked for mini tripods or anything close to that to hold my phone. 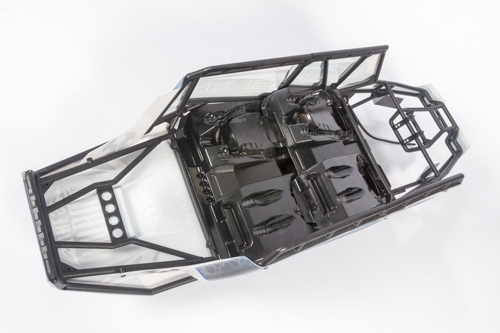 With nothing on the market, I went home and looked through my RC parts bins. 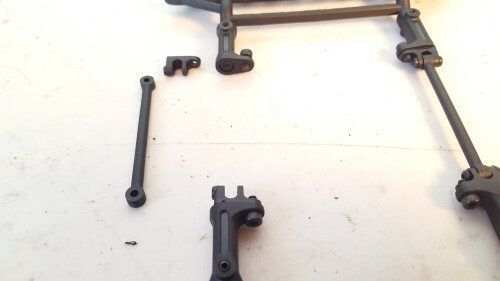 After looking at some parts and pulling stuff that may work, I started configuring parts together. 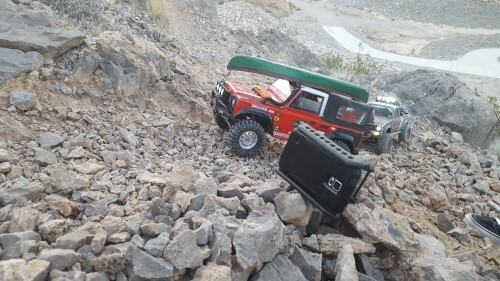 The rock sliders from parts tree AX80042 looked like it would cradle and protect my phone. 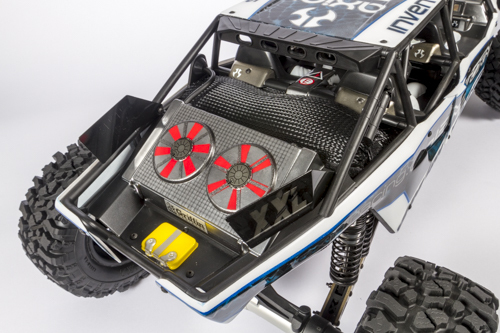 I mention protect because I have hit my phone that I had propped up with a rock while filming my Axial Yeti TT at full speed on 3s. It took an unexpected bounce and that was all she wrote. Phone insurance doesn’t really work as well as you would hope; it’s always expensive. 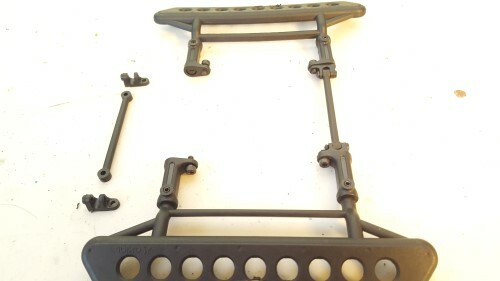 After finding what I think will work for a cradle I looked for pieces that would connect the two. 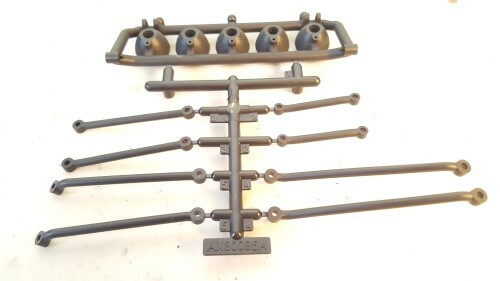 The upper left pieces are straight so they looked like they will work. 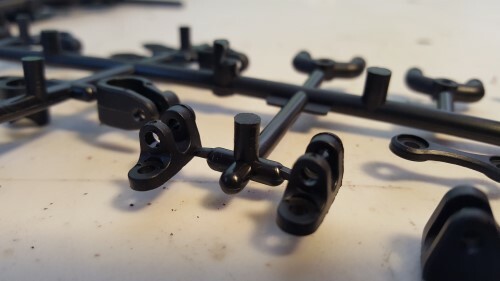 I found these on the Axial parts tree AX80085A. 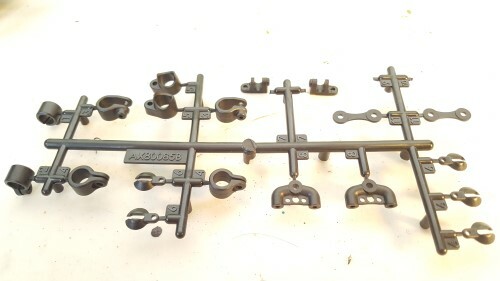 Next I needed some sort of hinge or a way to connect these pieces. 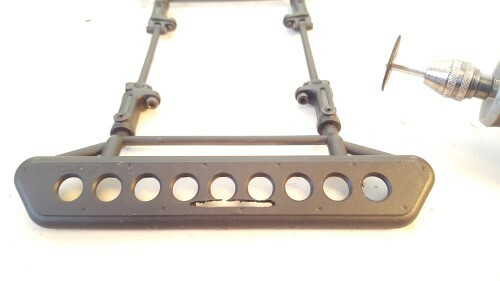 If you look you can see I broke off the pieces I needed. 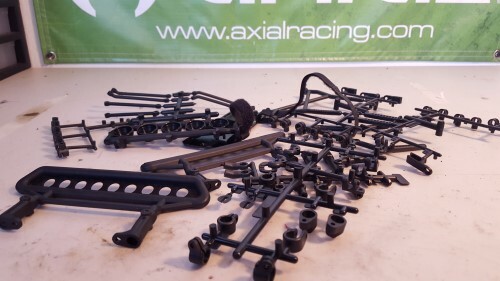 I found these on Axial parts tree AX800858 part #7. 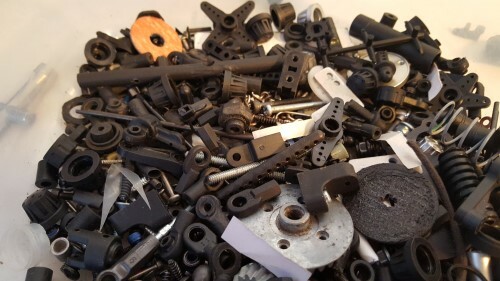 These are all of the pieces I have gathered. Parts tree AX800858 on the left, AX80085A in the middle, AX80042 on the right (you will need 2 of these), and a Axial hook and loop battery strap pictured at the top. 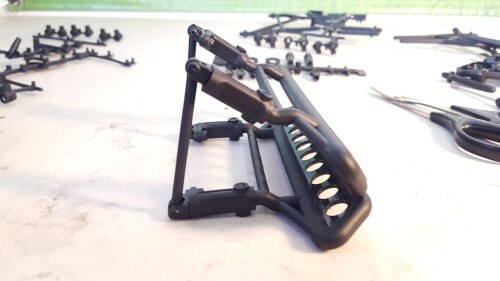 I started by attaching these hinge pieces to the foot of a complete rock slider. 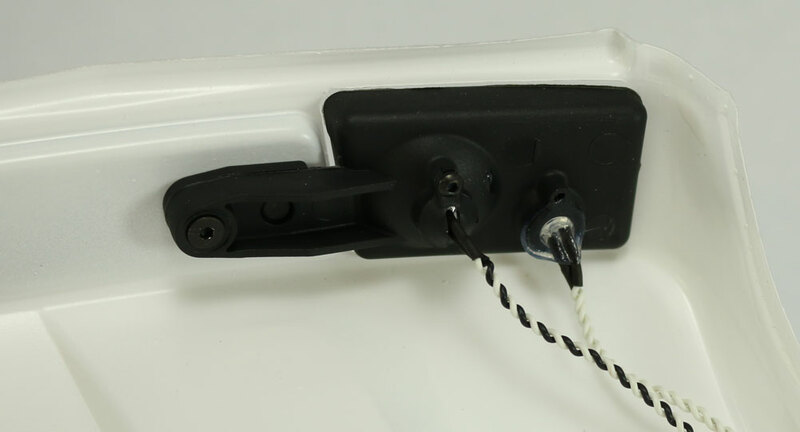 It should look like this, I was able to use the plastic hinge side to secure the screw, so I did not use a nut. 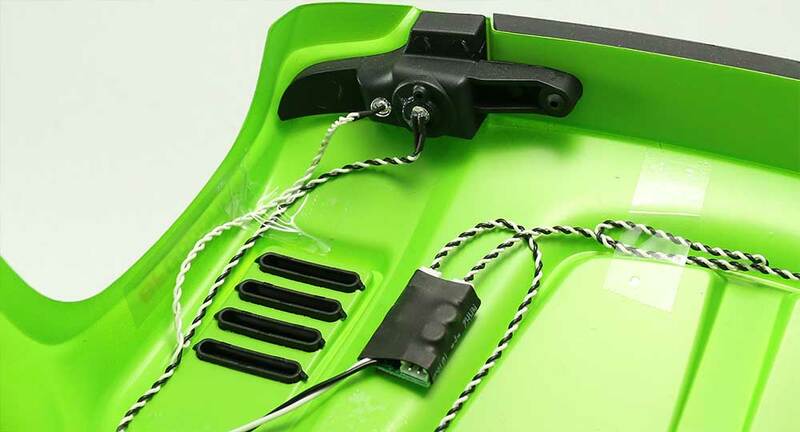 Try not to over tighten as it’s plastic and will be loose if you do so. 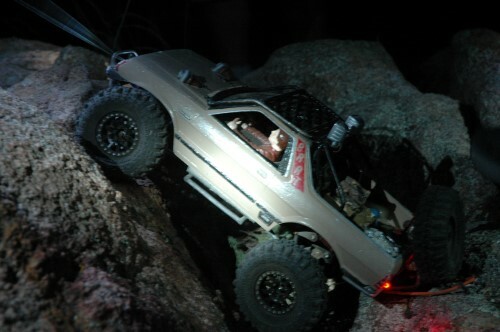 This is done on both sets of rock sliders. 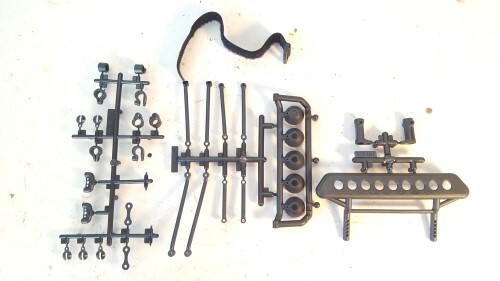 Here I have assembled one side and you can see the pieces needed on the left. 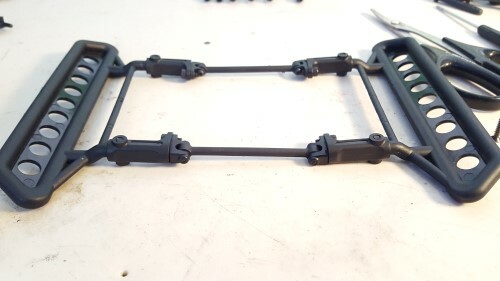 Make sure the sliders are both facing same direction. Mine are facing down, this should act as the cradle. 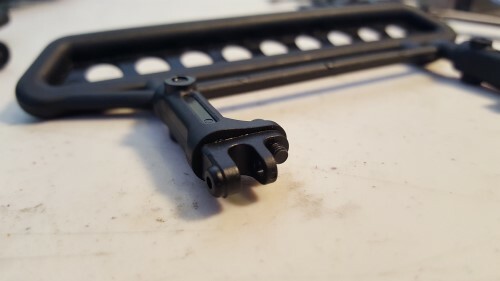 When folded over this is what it looks like. After putting my phone in this contraption I could see I needed something to latch it down. 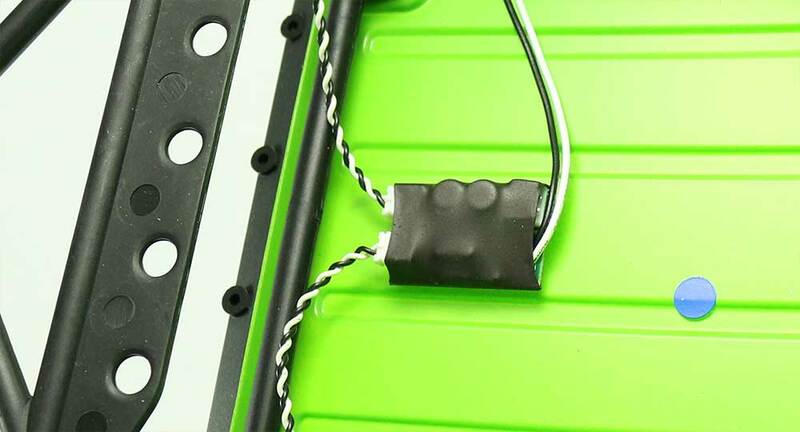 This is where the battery strap comes into play. 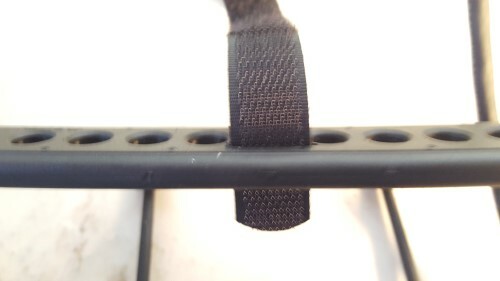 I used a Dremel tool and cutting wheel to make any opening for the strap to feed in on both rock sliders. 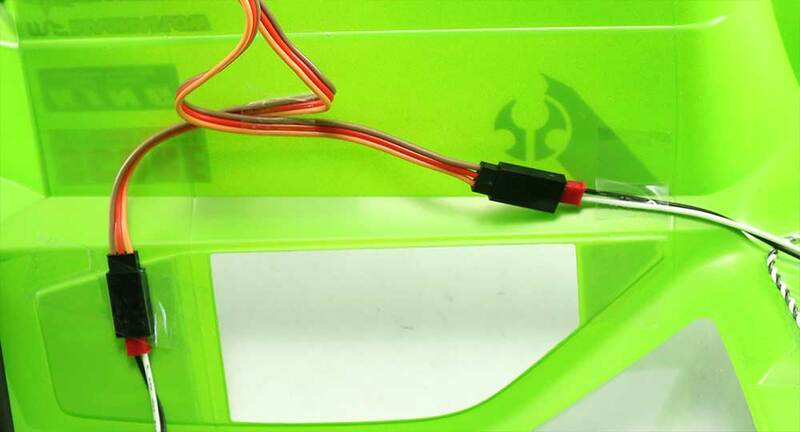 Once feed through it should lock on itself and hold phone securely. 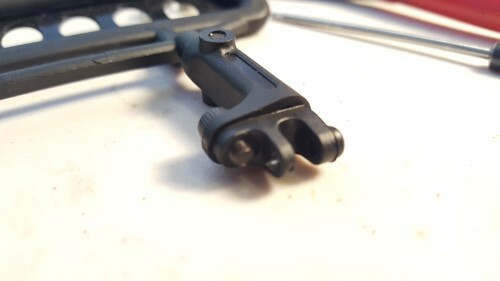 With the hinges on the top and bottom I have a lot of adjustment to tilt the phone up or down and since its a hook and loop strap, for adjustment I can fit it to pretty much any phone! 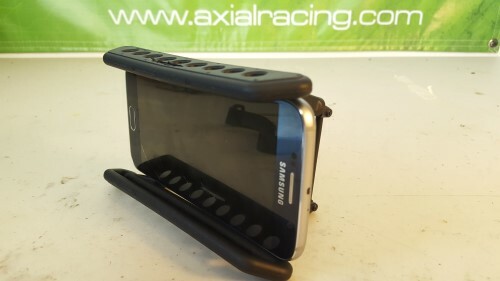 Now when I am on the trail, I have adjustment and protection for my phone and I can focus on driving. 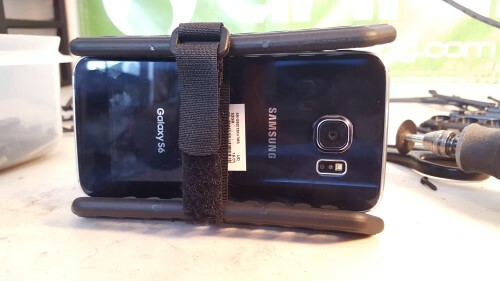 This is a bit of a steep angle and even without the strap you can see the phone stays securely in the phone pod. After weeks of use, it’s still working out great. No more looking for a rock or stick to prop it up. 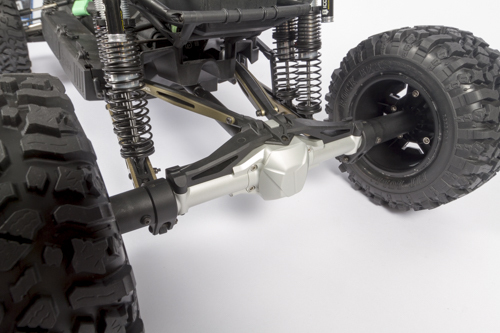 Repurposed Axial parts can work for more than you think. 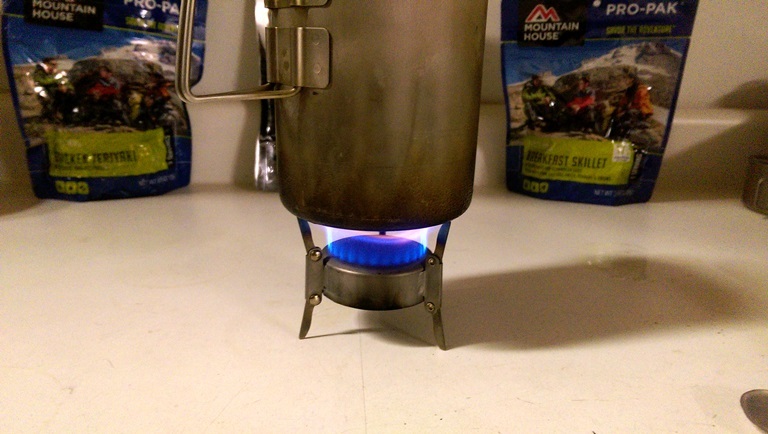 I discovered lightweight adventure stoves while collecting my bike packing kit. 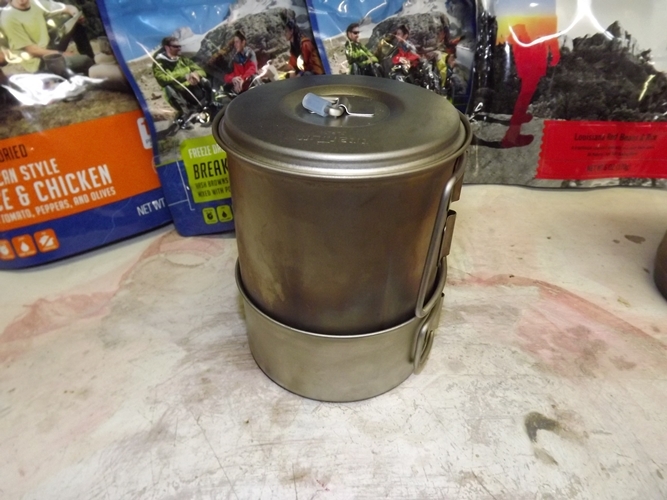 These little stoves are great for backpacking, bike packing, camping, and generally any outdoor adventure you have planned. 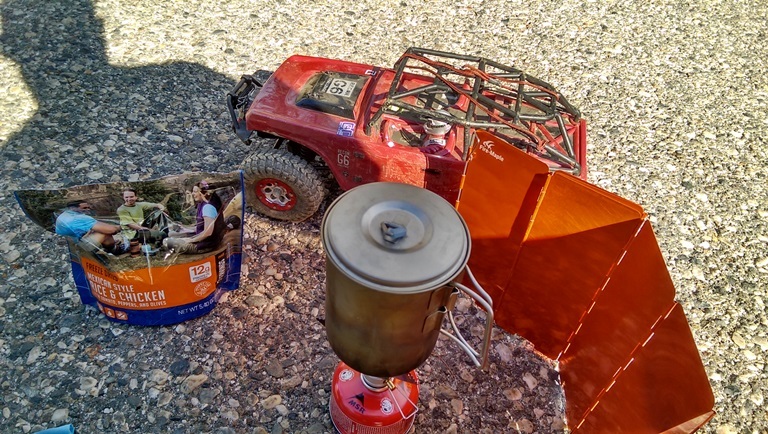 What I’ve learned is that these little stoves are also great when paired with Axial scale vehicles. 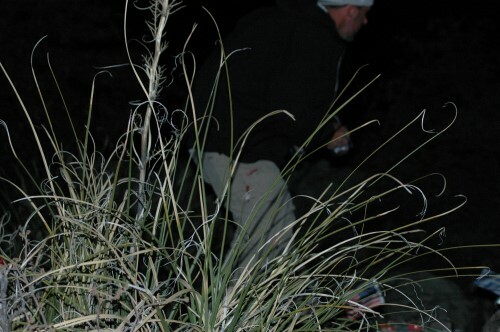 Nothing is better than a hot meal while out on the trail to keep your energy levels up. 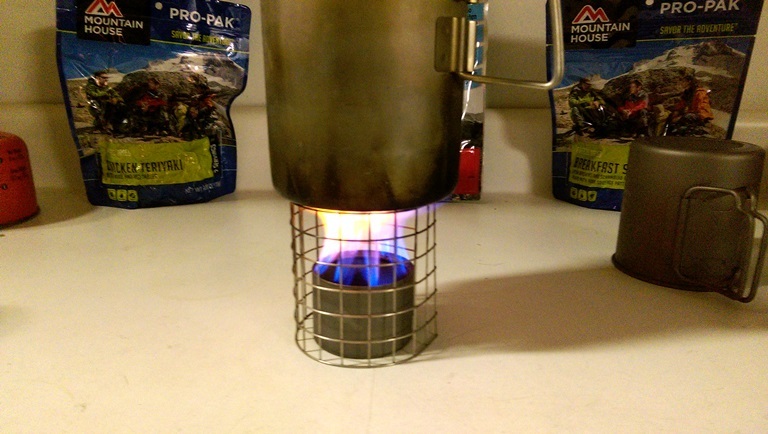 The following is the collection of stoves and cooking kit accessories that my RC and bike packing buddy, Mike, and I have collected over the past few years. 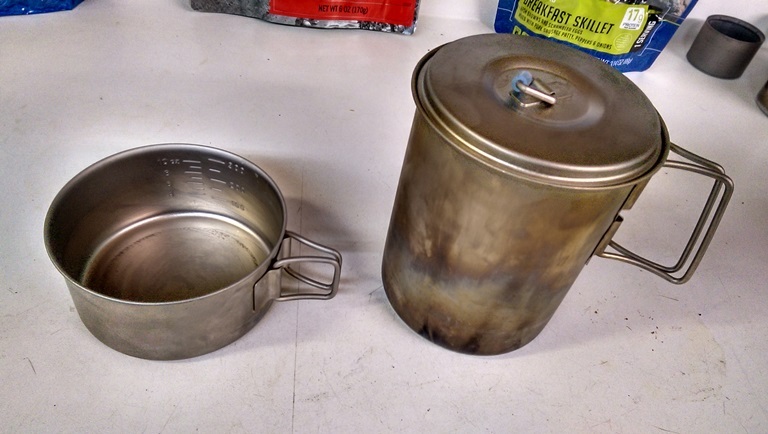 The first backpacking stoves I used were made from aluminum cans. 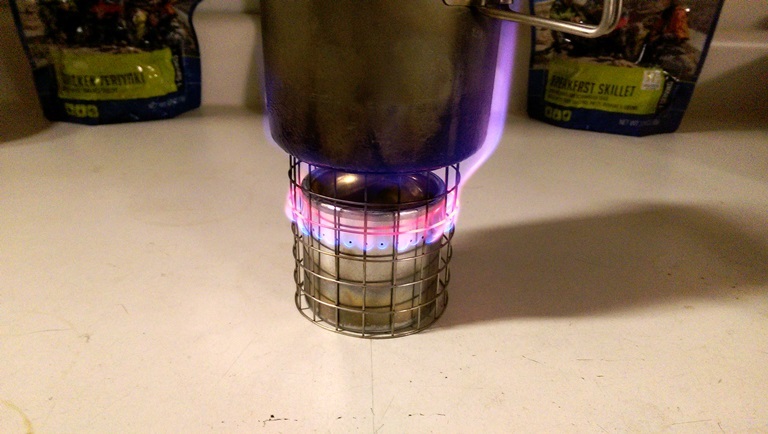 There are numerous variations of these alcohol burning stoves, but this one is my favorite because it is uber easy and mega fast to construct. 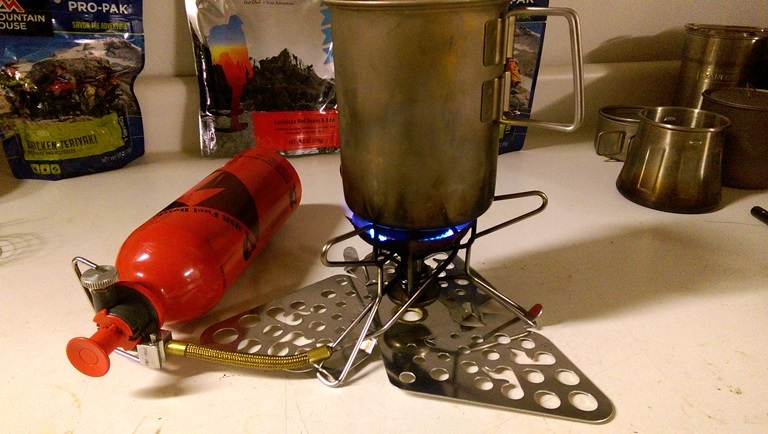 You can build this stove in less than 5 minutes, even out in the wild. 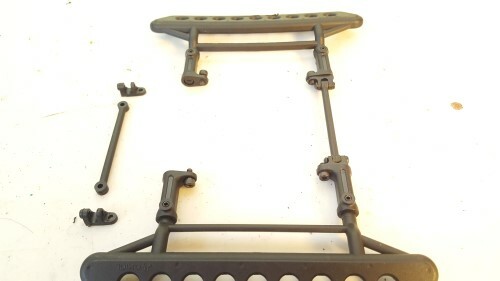 Look for instructions on how to build this stove at the end of this blog. 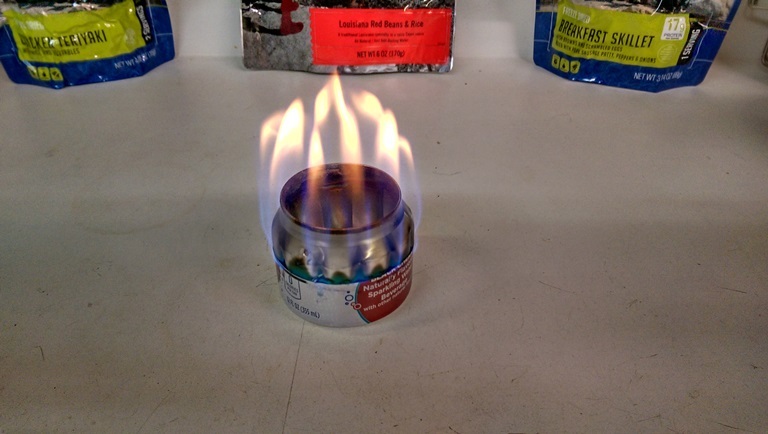 This little soda/beer/hops can stove is great because it weighs and costs nothing. The downside is that it is not as efficient as some of the other stoves I have, so it burns more fuel than some of my others. Also, like many of these stoves, there is no adjusting the flame, so you only have on or off with the flame. The second stove I acquired is this Vargo Triad. This stove is really cool because it’s so small. It collapses down into this tiny package. 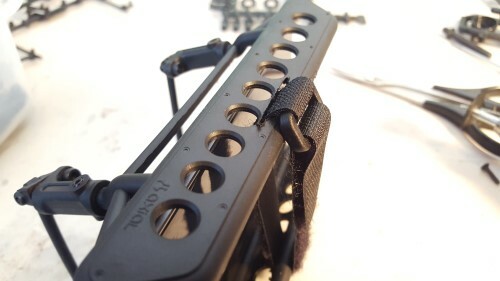 It’s also made from titanium, so it’s ultralight. This stove is super efficient, but can be a little finicky to get to bloom into full flame. It took me some practice to learn the nuances of its filling/lighting/blooming process. The third stove in my collection is this Esbit spirit burner. 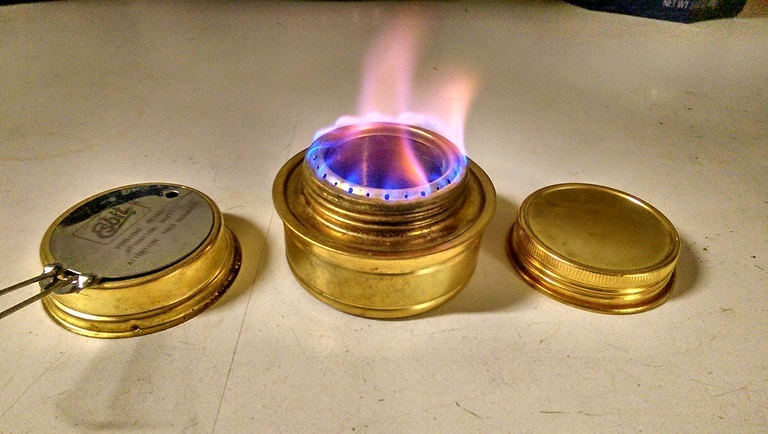 This is a copy of the timeless Trangia spirit burner stove that has been in production for over 60 years. 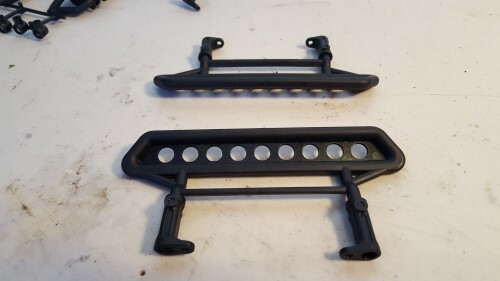 This is the stove that is currently in my bike packing kit. There are several reasons I like this stove. 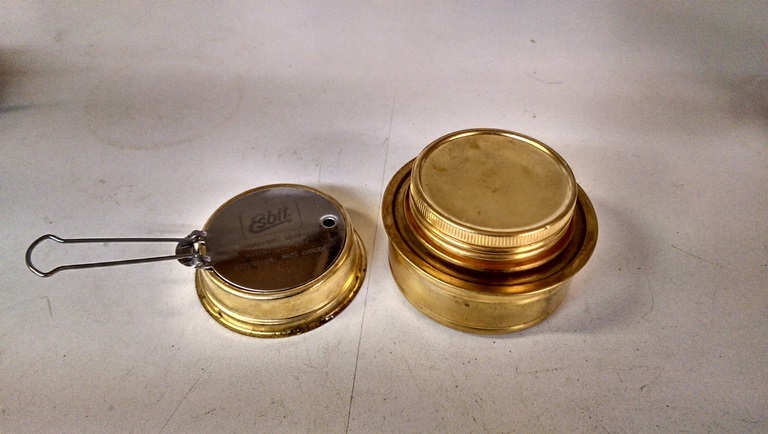 One reason is that it has a gasketed cap, so you can store your fuel in your stove for transport. Another reason is the snuffer/simmering ring that not only makes snuffing the flame easy, but also allows you to modulate your flame. But the best part of this stove is how easy it is to light and how quickly it reaches full bloom. This stove has two drawbacks. 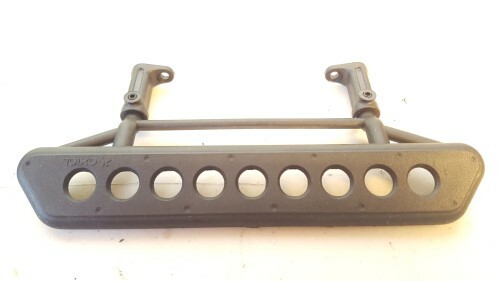 The first is that it is made of brass, so it’s a little heavier than the aluminum and titanium options. The second is that it requires a separate pot stand. 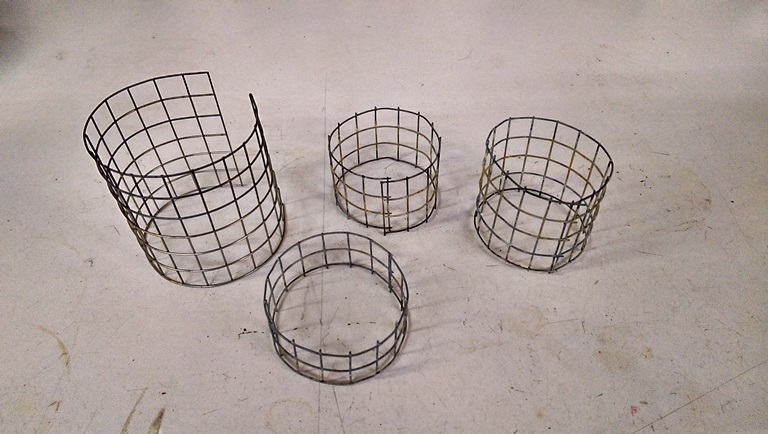 There are a few pot stand option on the market for this stove, but I fabricated one out of some wire mesh I had laying around the shop. This little stove is called the RUCUS, I believe. Mike found it on eBay for pretty cheap. 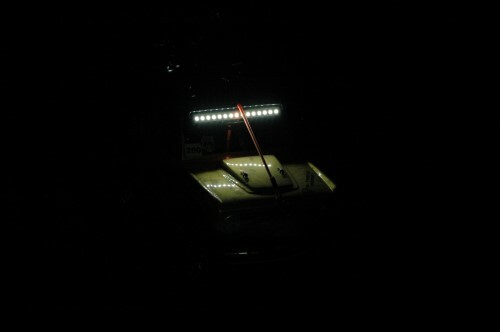 It’s similar to the Trangia in that it lights easily and requires a pot stand. It’s lighter than the Trangia, but doesn’t have a lid. It worked out pretty well for Mike, but he found another option that he is currently using. 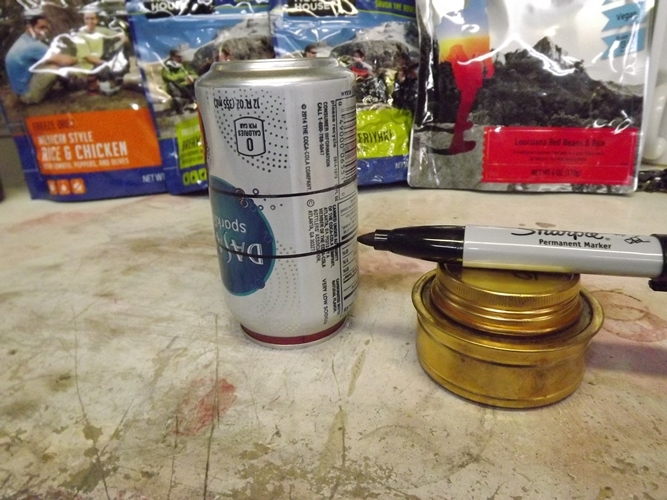 Mike found this tiny stove on www.toaksoutdoor.com. 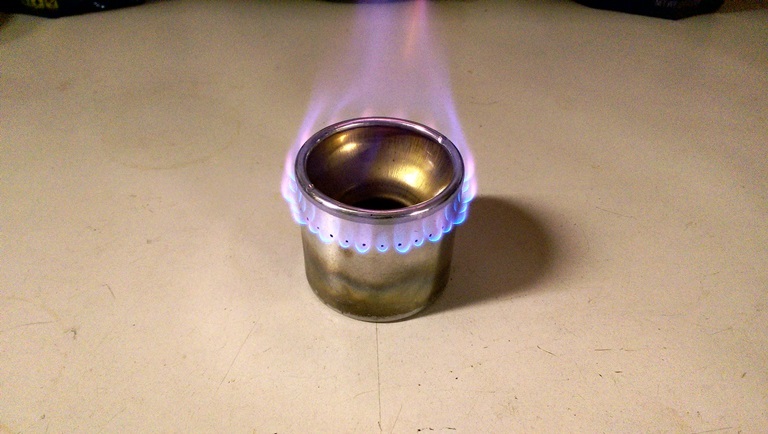 This stove is awesome because not only is it tiny (about the size of a shot glass), but it’s also made out of titanium. 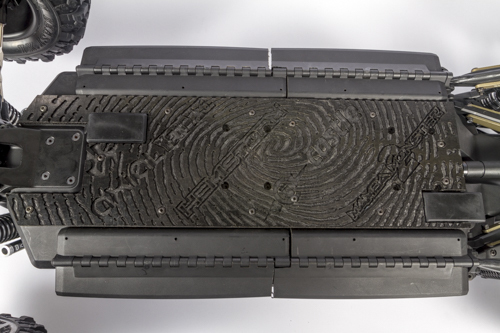 It has an awesome flame pattern that directs the heat into the center of the stove. 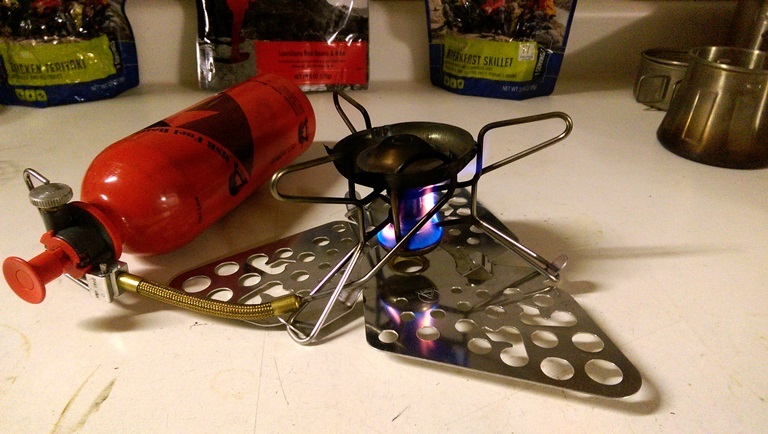 This is the stove I’d be rocking, if I didn’t have my Trangia. I really dig it. All of the above stoves burn denatured alcohol. 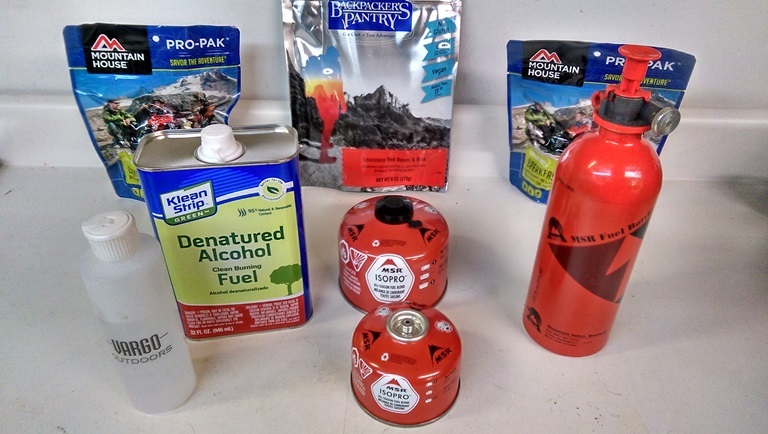 You can find denatured alcohol at your local home improvement store’s paint department. 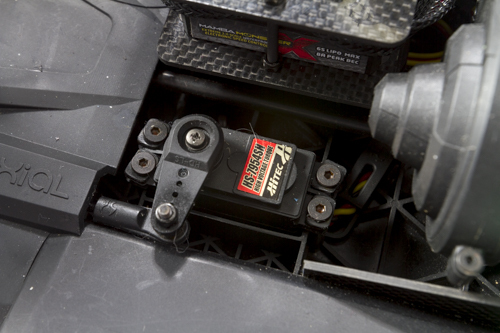 You can also find it at auto parts stores or gas stations labeled as HEET fuel treatment. 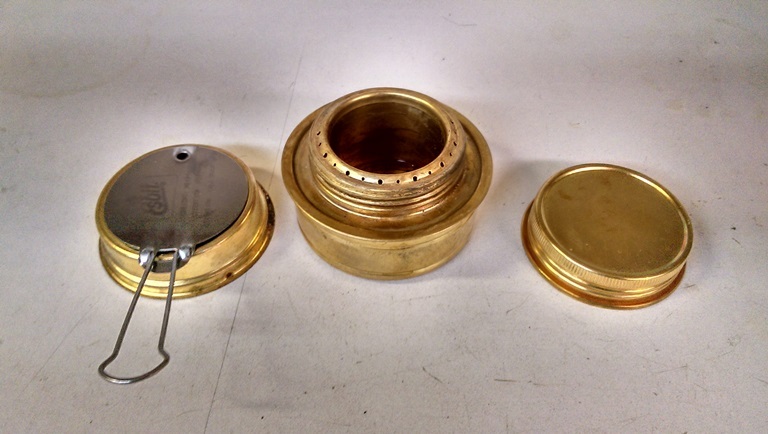 The following stoves use a different style of fuel, isopropyl alcohol and white gas. 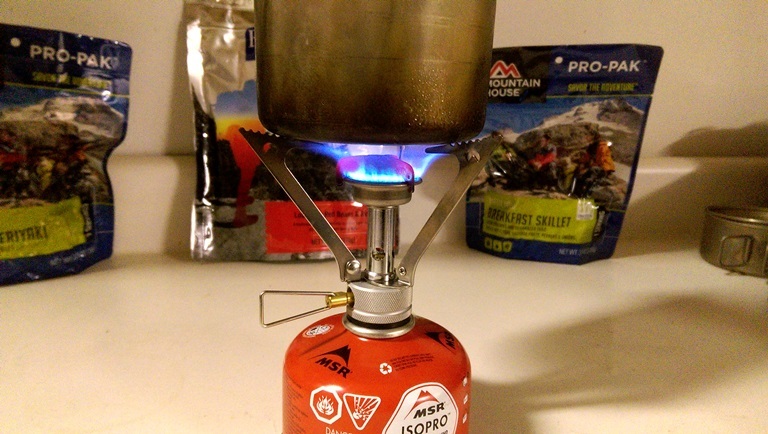 This stove is the MSR Pocket Rocket. 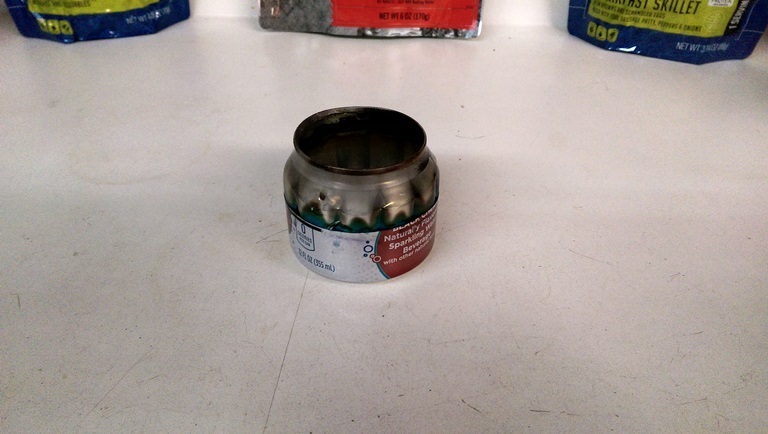 It uses compressed isopropyl alcohol in these canisters. I got this as a Christmas present one year. It’s not as compact as my other stoves, so I use it at events where I can cook out of the back of my car. Here it is in action. 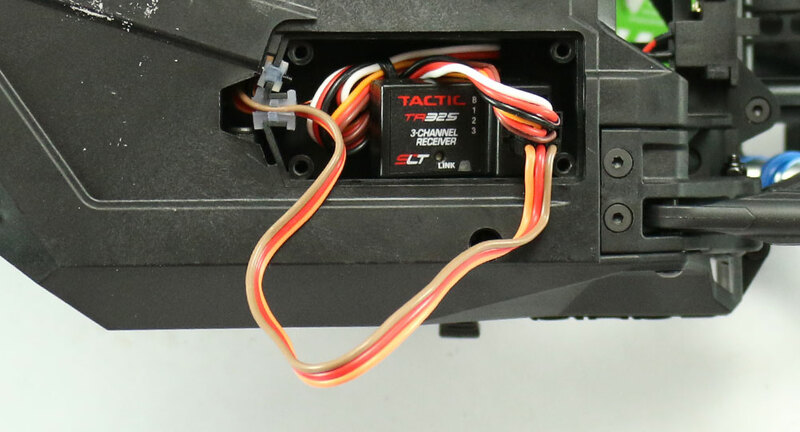 I added the silicone nitro fuel line to the lid handle. It makes removing the lid when hot much more pleasant on the fingers. 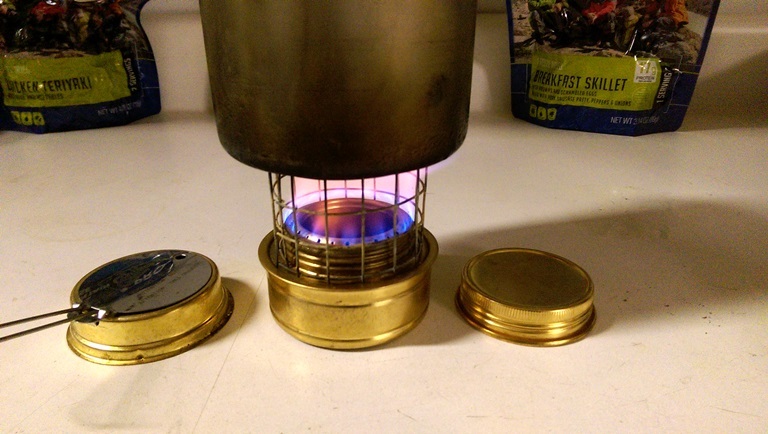 This stove is great because it is ultra efficient and can boil my water in under three minutes and incorporates a nice large pot stand. 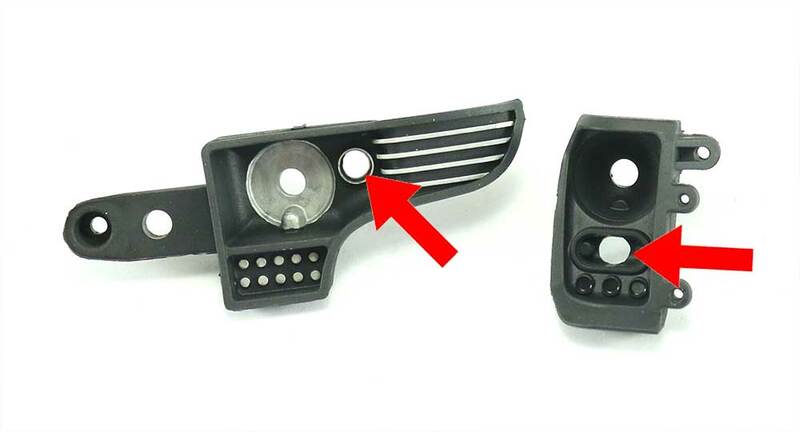 It also has an adjustable valve that allows the user to control the flame temperatures. This would be good if you were cooking food directly on the stove. 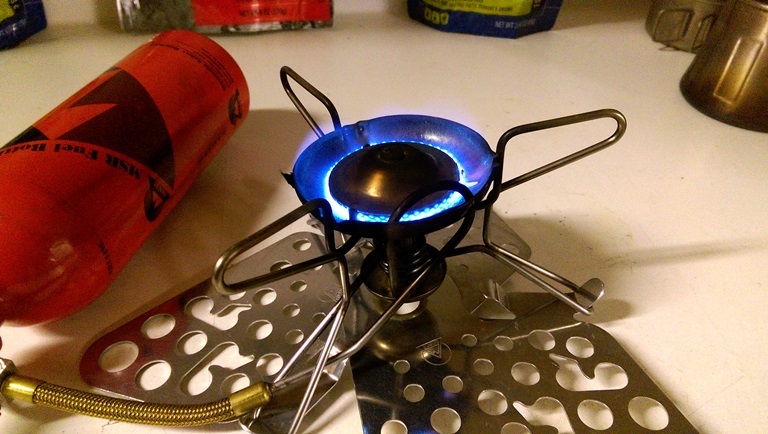 This stove is Mike’s MSR Whisperlite. 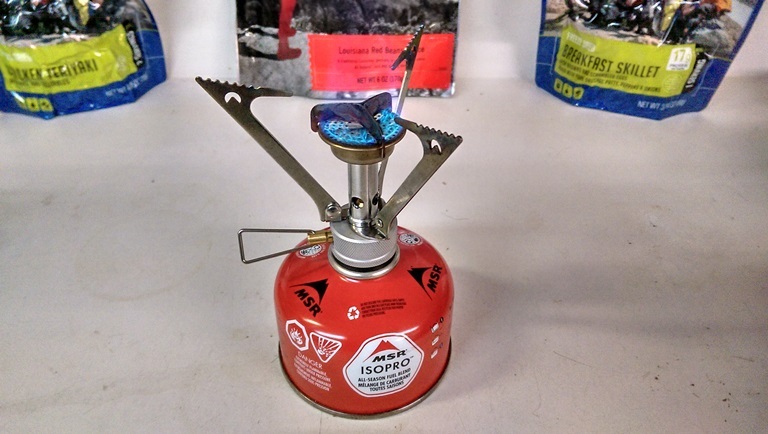 This one burns Coleman white gas, but there are other versions that are multi-fuel compatible and will burn gasoline, kerosene, white gas, and even isopropyl canisters like the ones the MSR Pocket Rocket above uses. 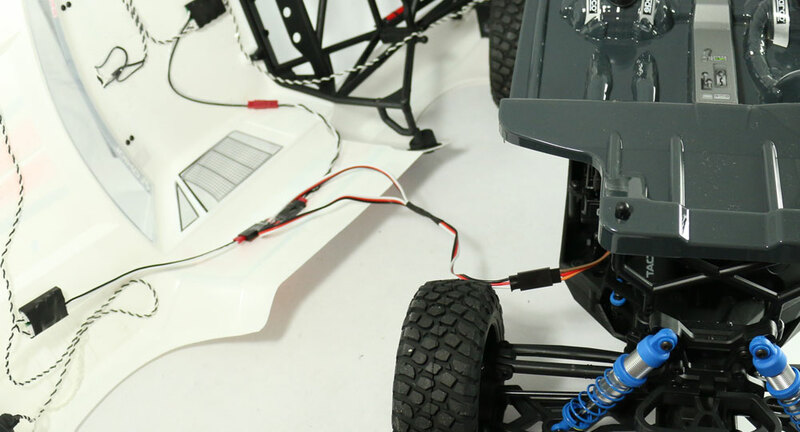 Once It’s lit, it has a very efficient flame, but as you can see it requires a fairly large external fuel bottle. It does have a nice large pot stand and adjustable flame, so this is the stove of choice if you are trying to cook bacon, eggs, and hash browns out on the trail. 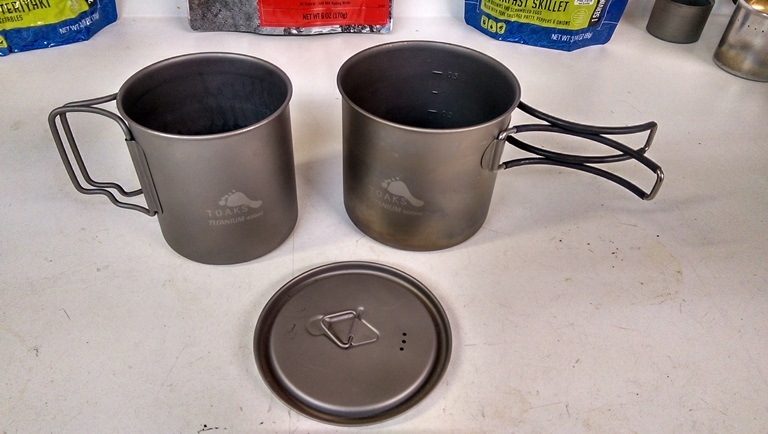 Pots are an important part of your adventure stove kit. Just like the stoves, there are countless pot and pan options on the market. 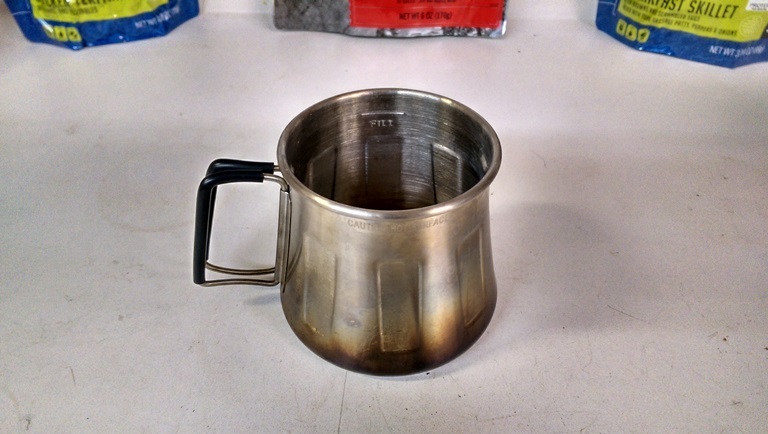 The first pot I used was this Brunton coffee cup I had in my other camping supplies. 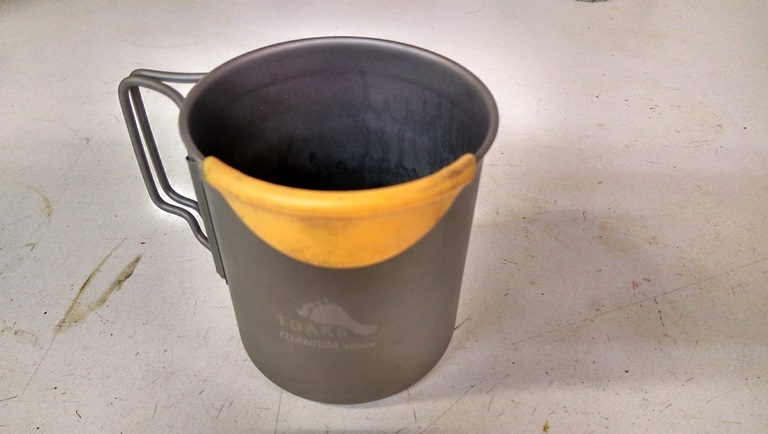 It holds 2 cups/16oz. 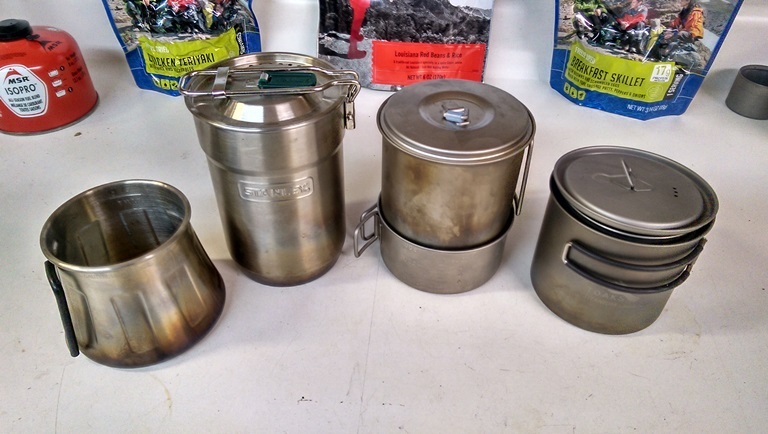 of water at the fill line, which is perfect since almost all dehydrated backpacking meals require around 2 cups of water. It also has silicone covered handles to keep your fingers from burning. The downside was it does not have a lid. I used this Stanley cook put for a little while. 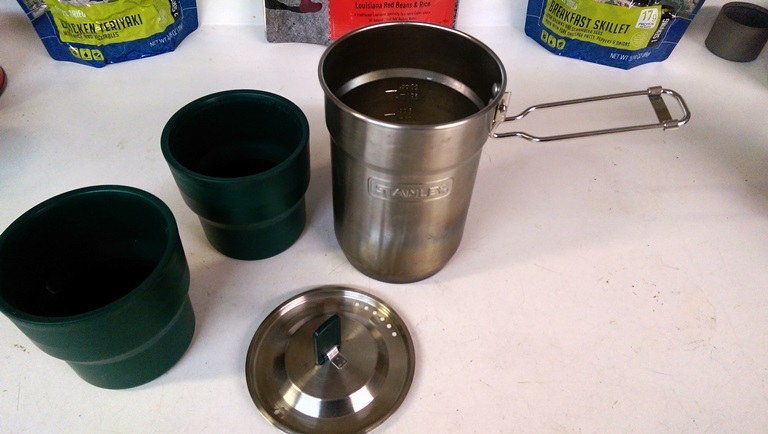 It does have a lid and even comes with these two insulated plastic cups that nest inside the pot. It has graduated markings for measuring, but was a bit on the tall and narrow side for me. So, now I’ve settled on this Snow Peak Mini Solo cook set. I like this one because it has a nesting cup for sipping coffee while my meal cooks. The cup is graduated, so I can measure my water accurately. It’s also made from Titanium, so it’s very lightweight. 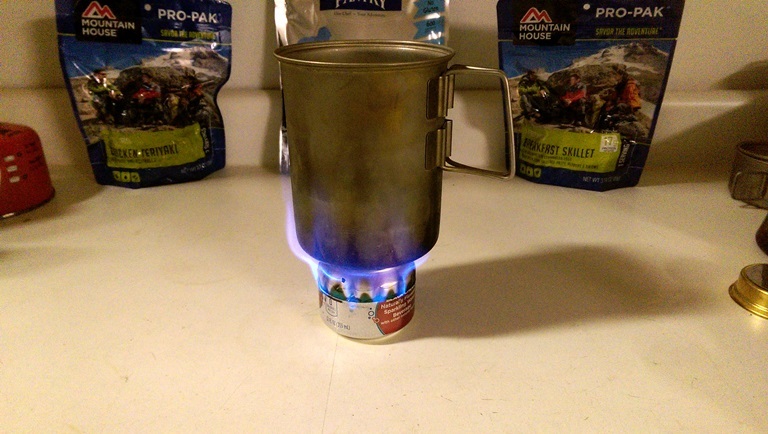 Mike also uses titanium cups for his cooking pots. 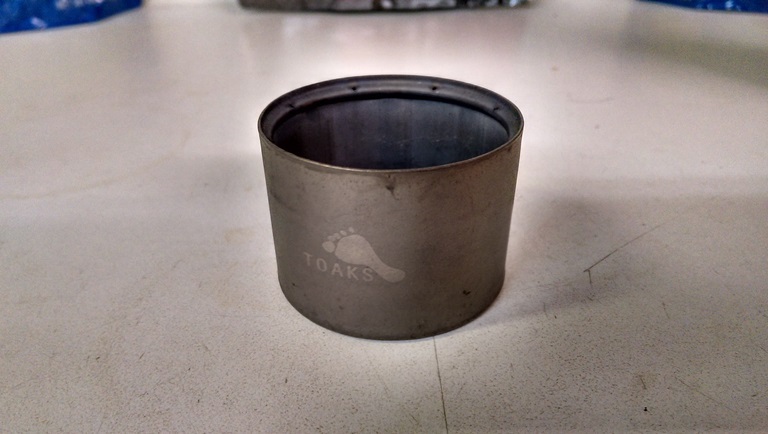 He got these from the same company that makes his tiny stove, Toaks Outdoors. 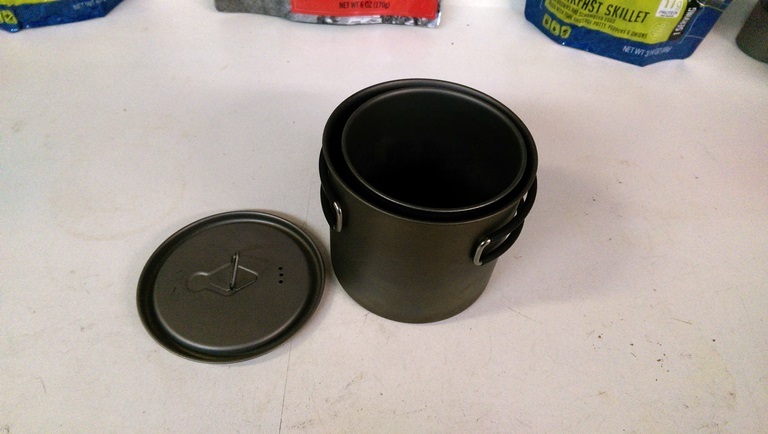 The smaller cup nests inside the larger one, and his stove fits inside the smaller cup, so it all fits together in one compact package. 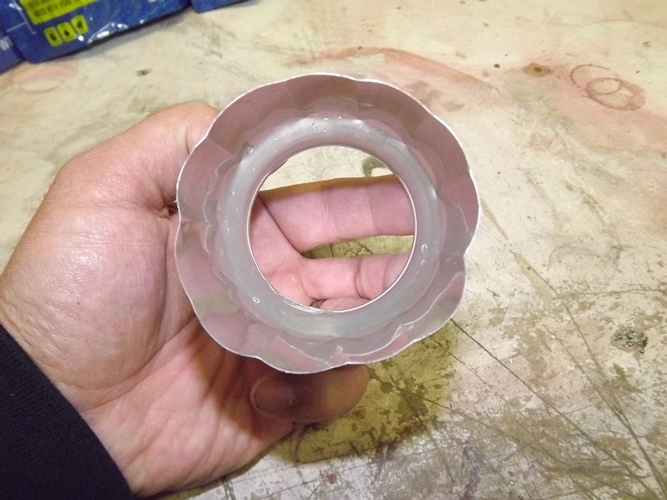 A pro tip is to get one of these silicone Hot Lips covers for your drinking cups. They prevent burned lips while drinking your pipping hot coffee. As I said, a separate pot stand is sometimes necessary. 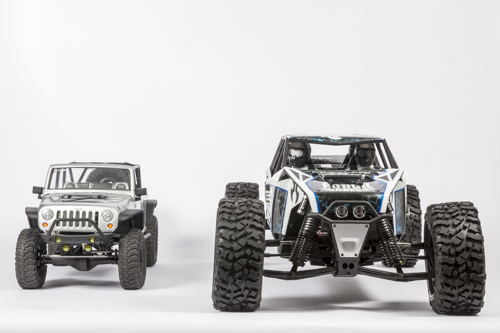 Here is a collection of some different sizes Mike and I have tried. It’s important to test the boiling times of your stove, because the distance the pot sits from the flame can drastically effect boiling times. 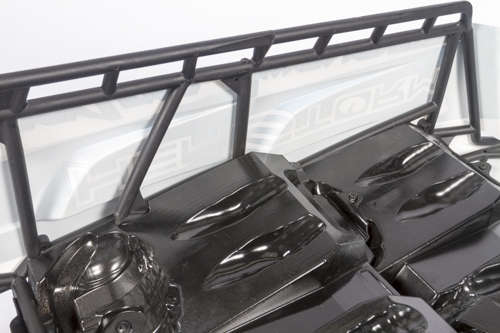 If these stands aren’t Gucci enough, there are aluminum and titanium pot stands available commercially. 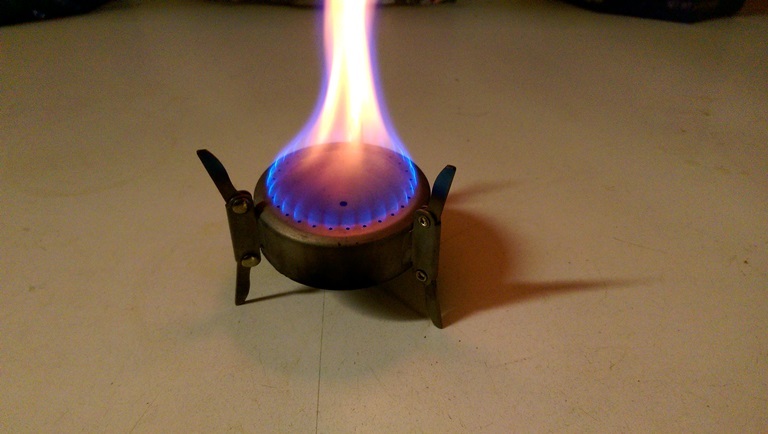 As with pot stands and pot/flame distance ratio, wind can greatly effect these stoves. It’s important to use a windscreen on all of these stoves. 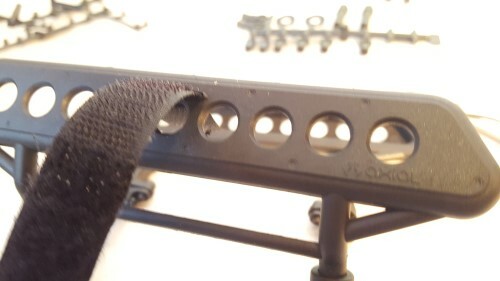 I’ve used aluminum foil and aluminum baking pans to make my own, but now Mike and I both use the Vargo aluminum windscreens. They fold flat and easily fit in our kits. The large orange Fire Maple screen I use with my MSR Pocket Rocket. Don’t forget to bring something to light your stoves. I usually carry a flint striker and a back up option of either matches or a lighter. 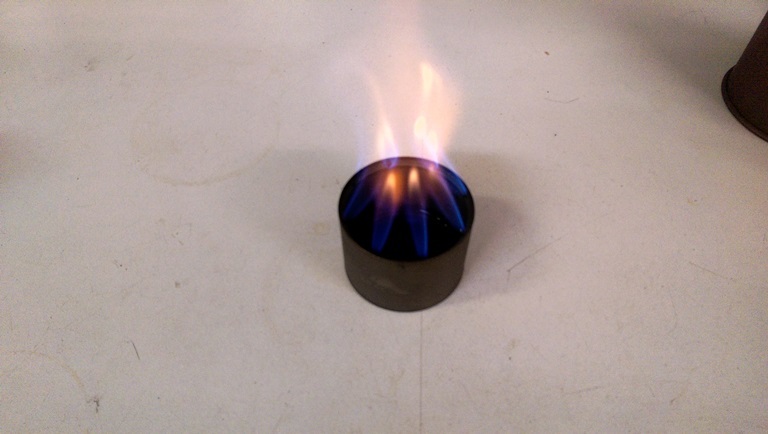 On really cold mornings, denatured alcohol can be difficult to start, so having a solid flame from a match makes things easier. The last important part of your cooking kit is your eating utensils. 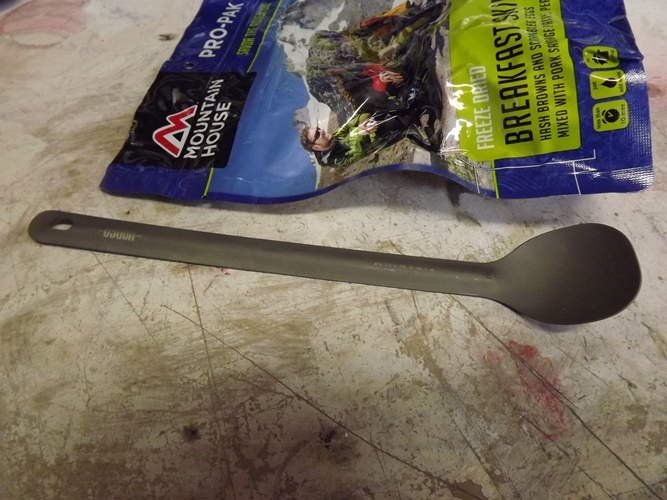 Since I only eat dehydrated meals, I really only need a spoon and this long handled titanium spoon from Vargo is just the ticket to reach the bottom of the bags without getting my fingers dirty. 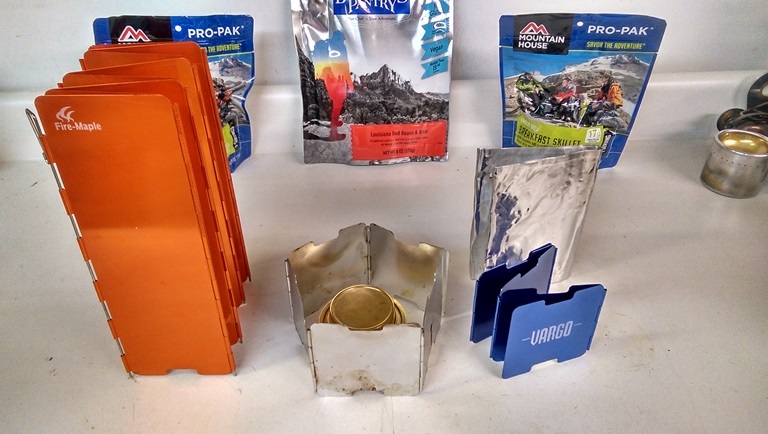 So, that’s the stuff that Mike and I use when out bike packing and out scaling There are tons of options out there, so don’t be afraid to do a little looking around to find the items that fit your style the best. 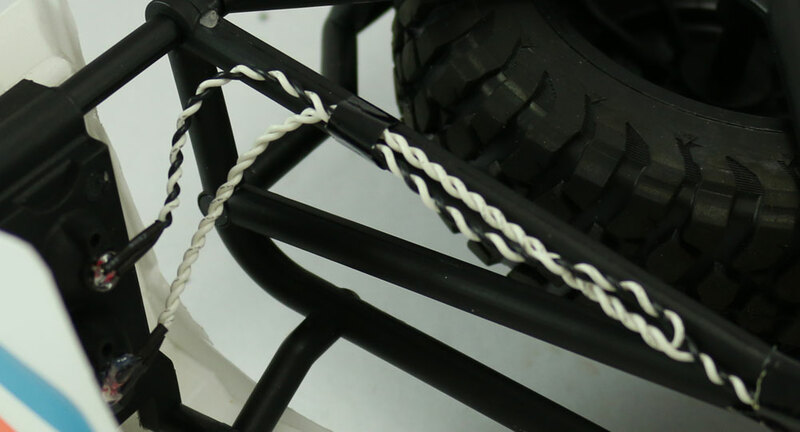 We’ll see you out scaling or maybe out on in the wildness while on a bike packing trip. 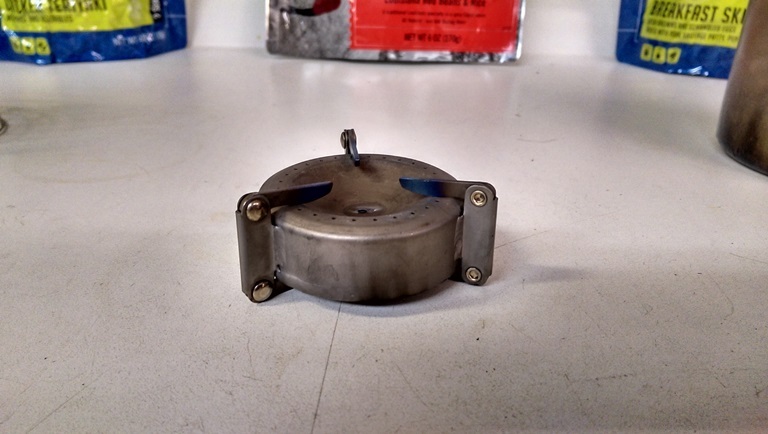 Keep reading if you want to learn how to build the first stove in this blog. 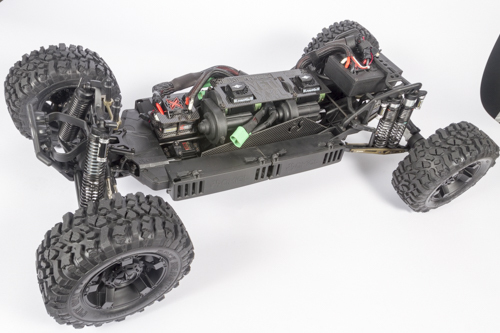 It will take you less than 5 minutes to construct. 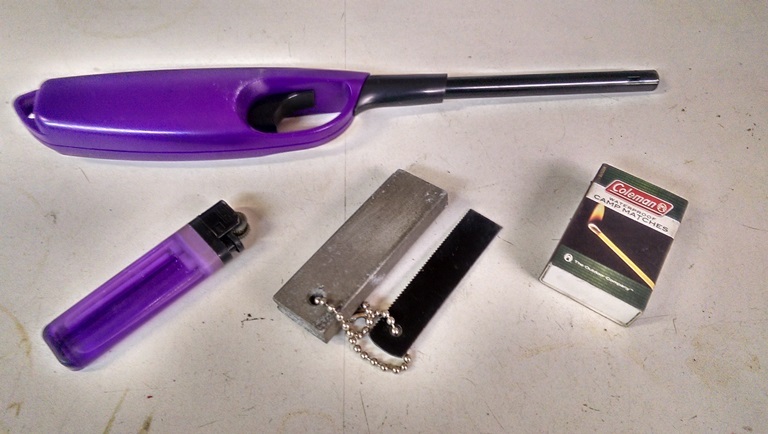 You will need the following items to build it: Aluminum can and scissors or knife, and a marker. A can opener is recommended, but not necessary. Step 1: Acquire an aluminum can. You can use pretty much any beer or soda can. 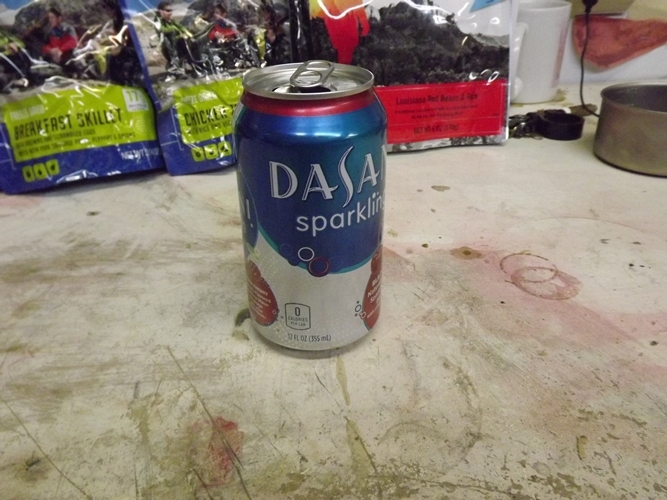 Here, I’m using a sparkling water can sourced from my wife. Step 2: Cut the top out. 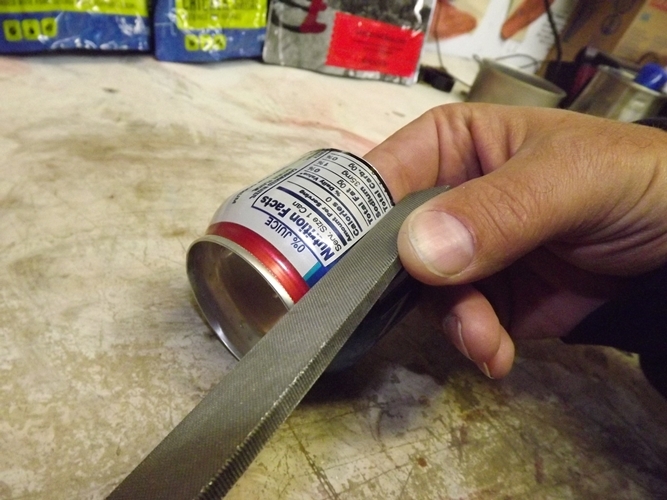 You can use a razor blade or utility knife, but a can opener makes extra quick work of it. Step 3: Mark the top and bottom and cut on the lines. 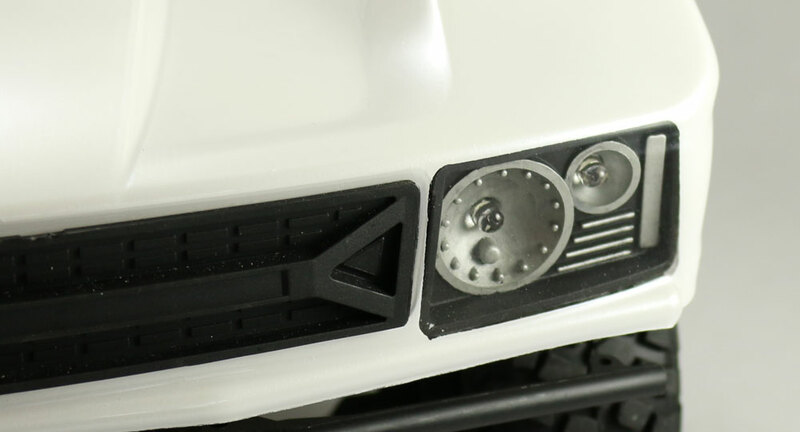 The top is 1 3/4″, the bottom is 1 1/4″. The sizes don’t have to be perfect, but the top needs top be a little longer than the bottom. 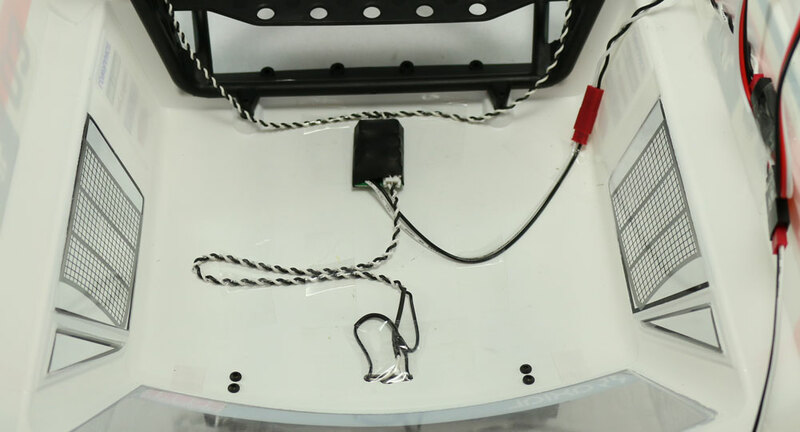 Step 4: Use a straight object to score ‘jets’ in the can. I used a file in my shop, but you can also use the blades of the scissors or knife. Placing two fingers in the can and scoring between your fingers is what I do. 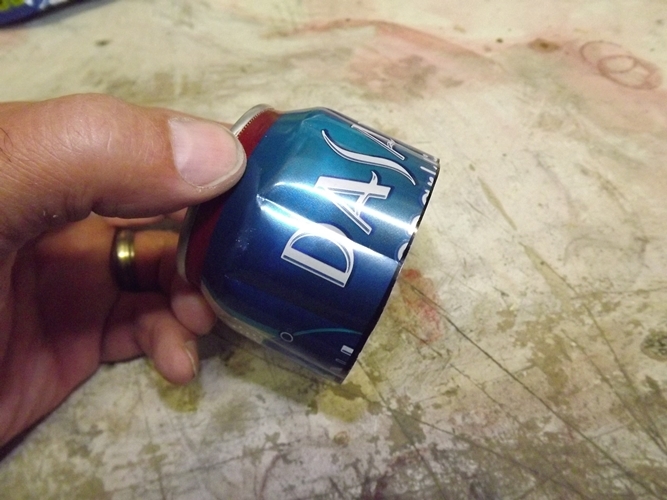 Rotate the can until you have evenly spaced creases all around. I usually end up with 8 or 9, but it will depend on your finger sizes. 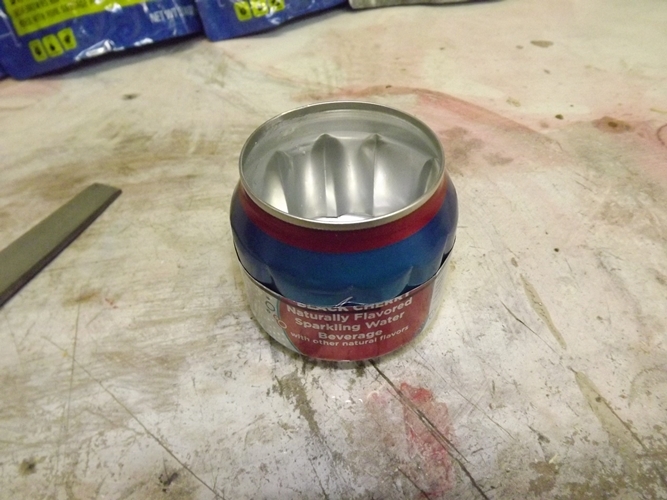 Your top can will look something like this when you are finished. 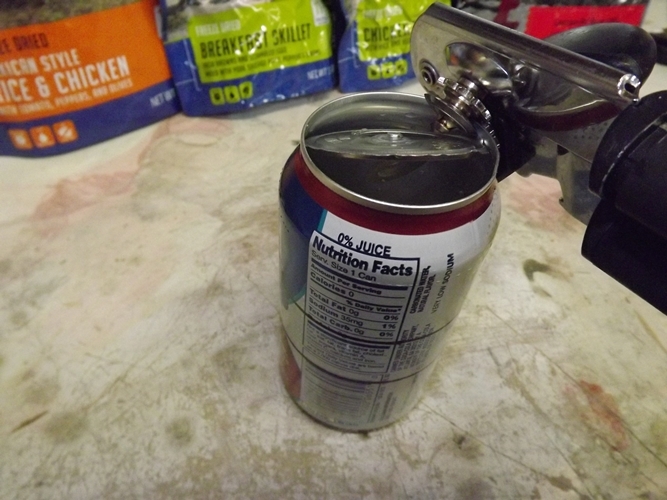 Step 5: Slide the top part of the can into the bottom part of the can, so it looks like the picture above. It may take a little finagling to get them to slip together. 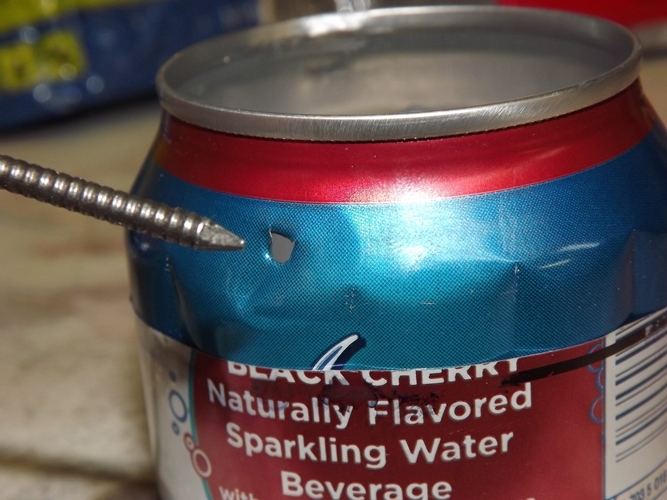 Step 6: Pop a small air hole into the top of the can. I used a nail, but the scissors or knife can also be used. The hole doesn’t have to be pretty. Now light it up and get cooking! 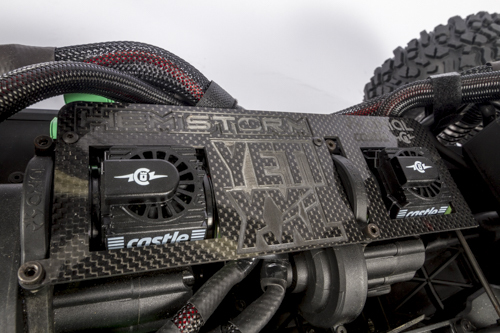 About a year ago, you may have noticed a project that popped up on YouTube created by HemiStorm RC, an Axial Yeti XXL. 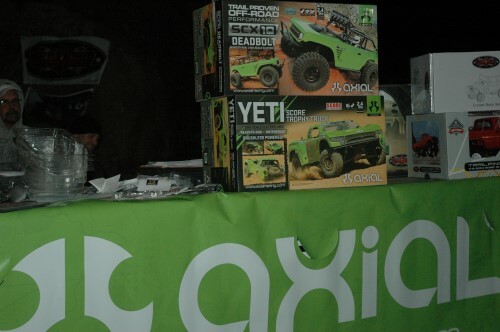 For a split second this may seem confusing because you’re probably asking yourself, does Axial make a Yeti XXL? Unfortunately that is not the case. 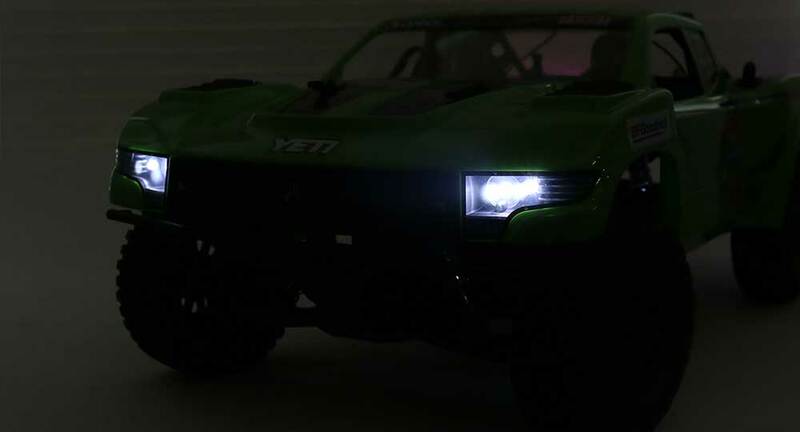 However, HemiStorm had an idea that would technically produce the largest Yeti XL in existence by grafting two, YES TWO, Yeti XL’s together and appropriately calling it the “Yeti XXL.” Essentially the back half of one chassis was cut off just in front of the transmission while the front half of another chassis was cut off just behind the transmission thus giving the Yeti XXL two transmissions. 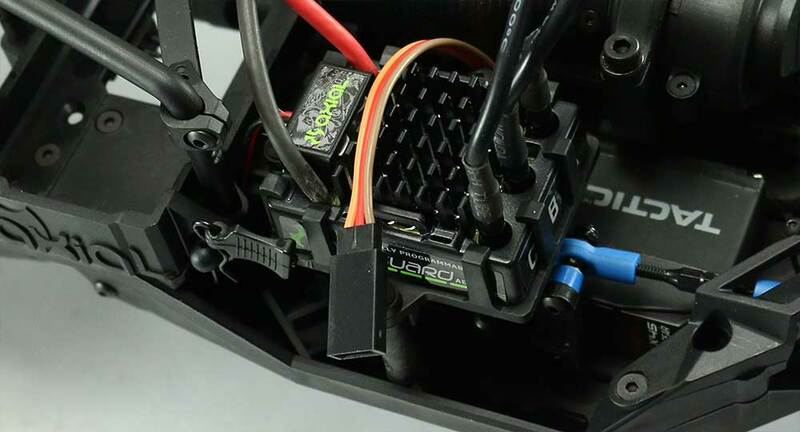 It seems slightly odd, but when you toss in two Castle Creations Mamba Monster X ESC’s the idea starts to make sense. 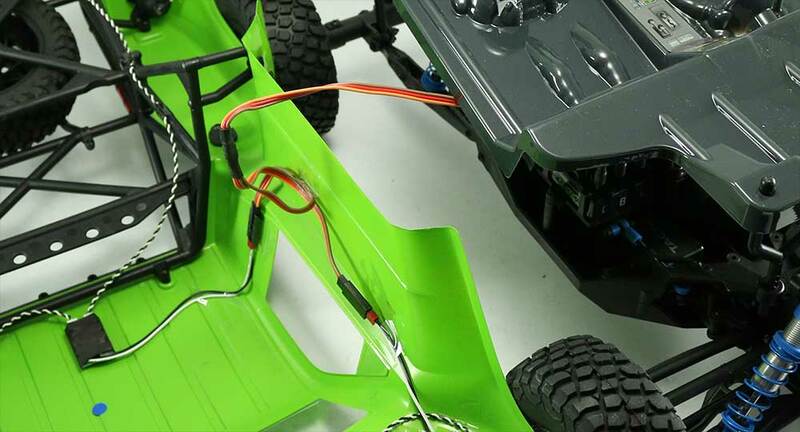 Each half of the vehicle is powered by its own esc and transmission allowing for the possibility of adding front or rear bias to the drivetrain. 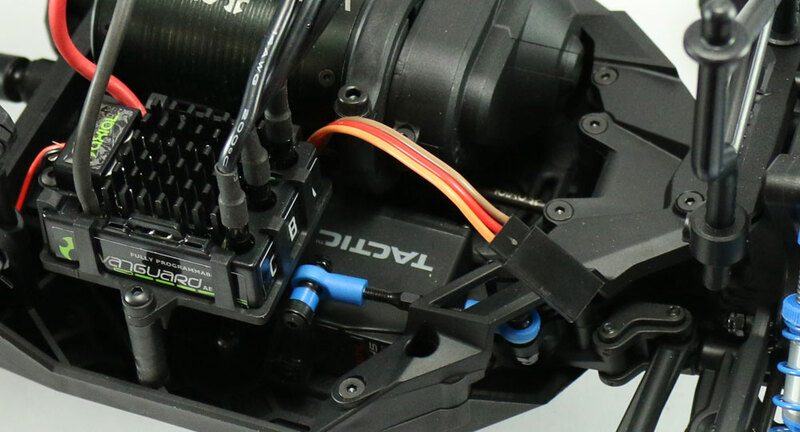 It’s an excellent idea considering the entire array of channel mixing capabilities within the Futaba 4PL radio he uses. 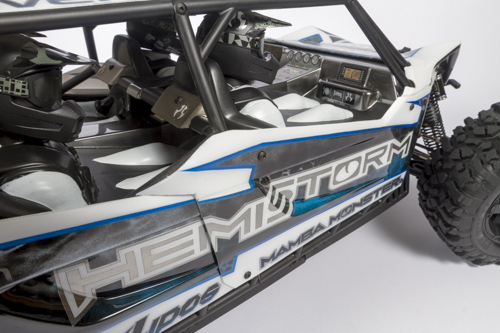 To HemiStorm’s credit, this was a massive task to take on that required a bit of engineering know-how, some trial and error, and the acquisition of a few special tools. 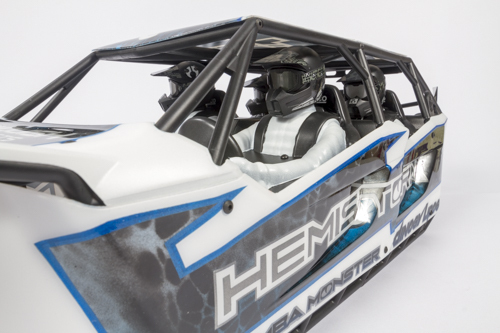 In order to properly tell the story behind the Yeti XXL, Hemistorm is going to be the best storyteller. 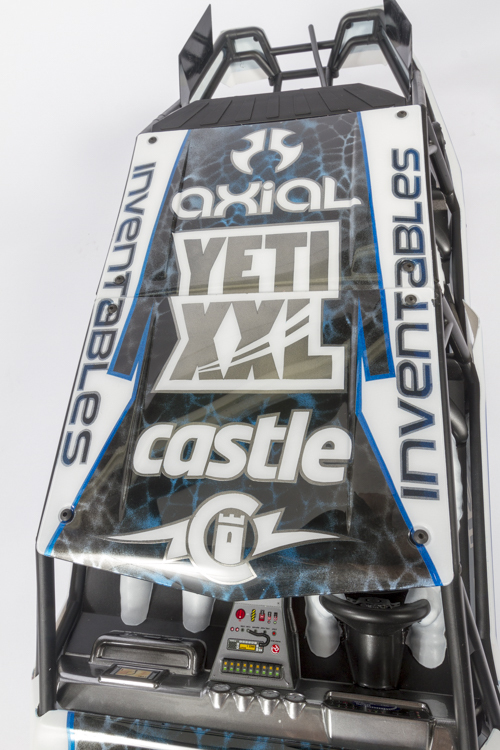 Think of this as a tutorial or timeline behind his Yeti XXL build. 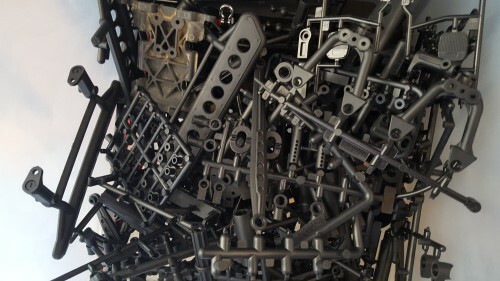 So grab a notepad, some snacks, and click the auto play button on your YouTube account to watch the entirety of his build process because it’s certainly worth a watch. 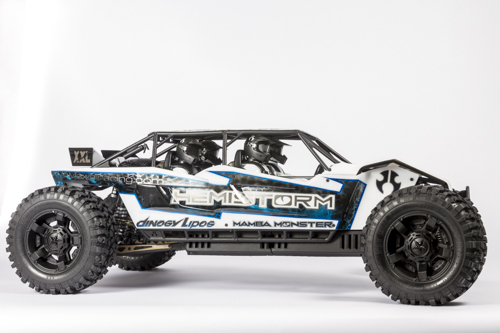 Now that you’ve got your healthy dose of video behind what it took for HemiStorm to make the Yeti XXL, it’s time for photos. 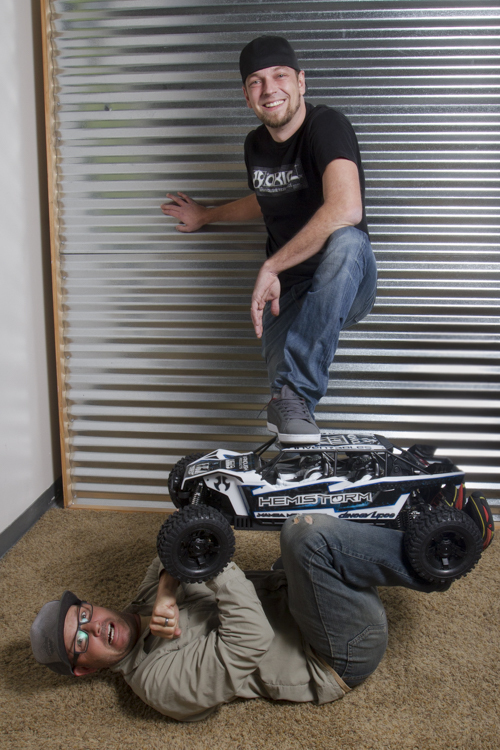 While Chris was in town for RCX he made a pitstop over to Axial HQ so we could get a closer look. Chris de Graaf a.k.a. 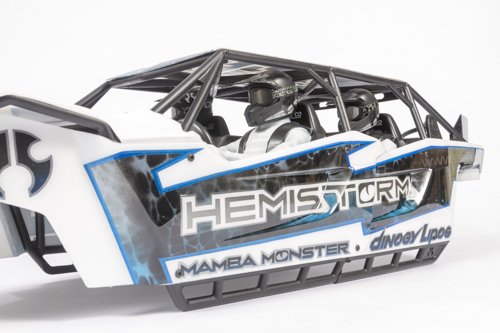 “HemiStorm” and Axial’s Rodney Wills having a few choice words. 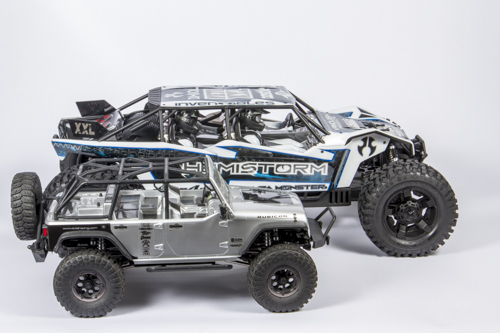 It goes without saying, but HemiStorm you’ve truly built a one-of-a-kind vehicle. Keep up all the great work and if you want to follow Chris on his various social media platforms see the links below. 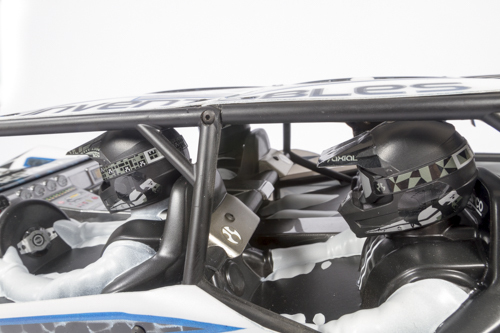 Trying to shoot photos of your RC car can be a daunting task. Often times, still photos look static and boring with no sense of motion or action to engage your viewer. 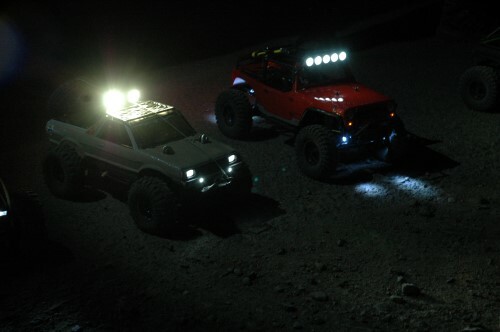 In this blog post we’re going to look at some simple ways to spice up your photography of your RC car by shooting at night time. We’ll start out with some quick and easy techniques that anyone can add to their skill set to produce better photos. Towards the end of this post, I’ll get into some more technical concepts if you want to really “dork out” on the nuances of night photography. 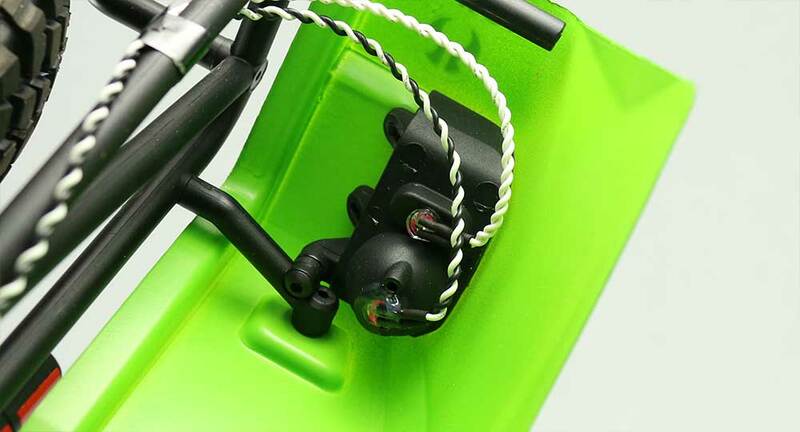 When you’re first getting started, try to focus on your camera angle. It’s really easy and natural to want to shoot from your eye level. 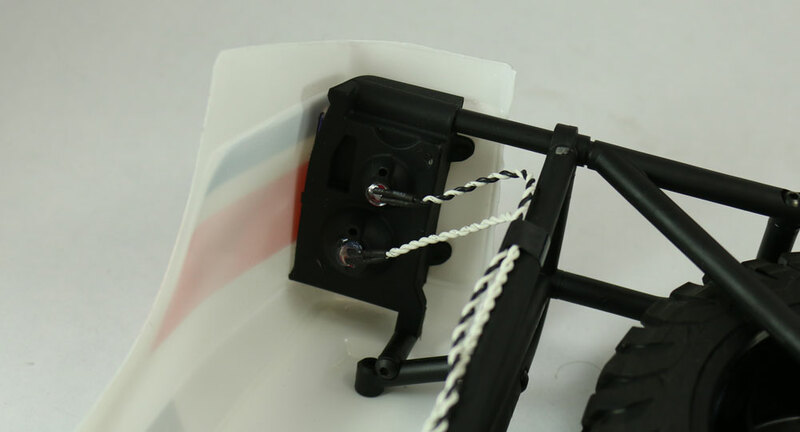 It doesn’t require bending down and it’s easy… hence making it the go to angle for most photographers. 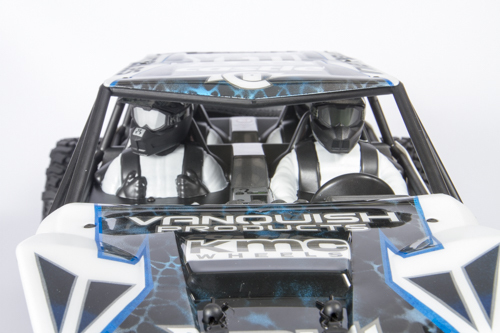 But when shooting RC cars, that “eye level” angle makes the car look like a miniature toy and not something interesting. I’ve found it best to get pretty close to the ground (6-12 inches off the ground) for the best results. 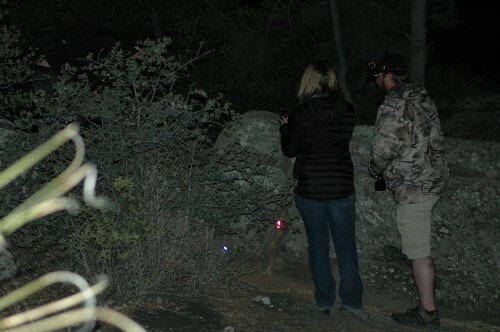 If you shoot at night, (in full darkness) you’re going to be limited as to what your camera can “see”. 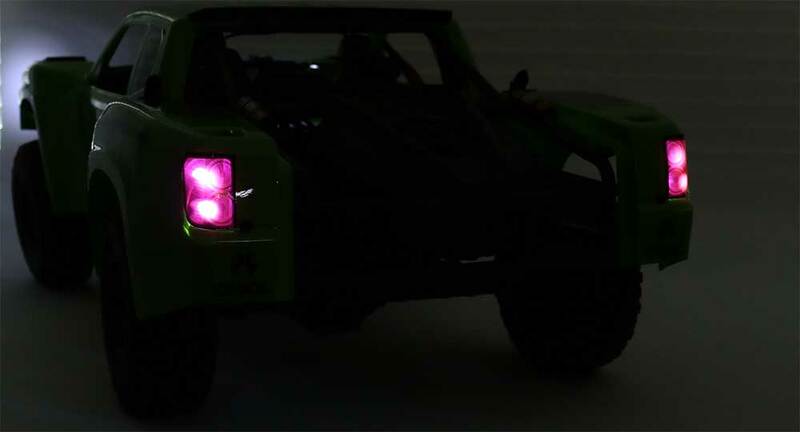 While you’ll be able to see the lights on your car, just about everything else will be pitch black. (If you’re using a DSLR camera, your camera’s sensor will be able to pull detail out of the darkness, but if you’re using your smartphone, there’s not a lot of hope.) For best results, try shooting the 45 minutes before sunrise or after sunset. The residual light on the horizon will give a soft glow to the sky and will allow your camera to take nicer/ more appealing photos. Try including the sky in the frame and that residual light will also give added depth to your photos. Let’s start out simple and use the camera that most everyone carries with them every day… your Smartphone. 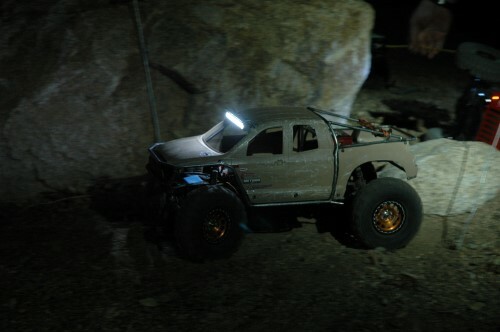 Aside from the fact that you most likely already own one, there’s very little in the way of added gear that you’ll need to invest in. 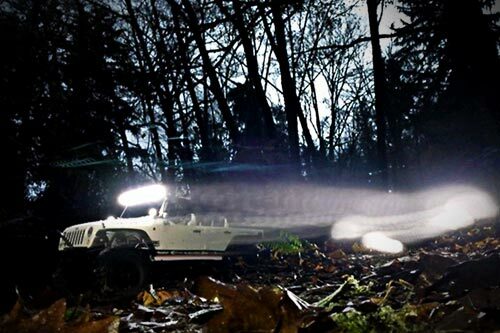 All you’ll need to do is get an app that will allow you to shoot photos at slow shutter speeds. I use SlowShutter as my personal go to app for this. It’s cheap at $.99 and isn’t difficult to figure out. (If you’re using SlowShutter, be sure to adjust the settings, in picture resolution to 8MP (30fps) or your photos will be so small they’ll be unusable for anything other than looking at them on your phone. I made this mistake my first time using the app and most of my photos didn’t turn out). 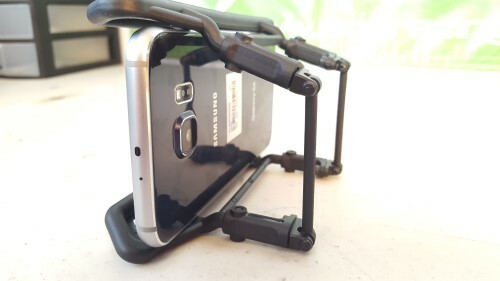 Aside from your phone and an app, you should really consider a tripod and tripod adaptor for your phone. But don’t worry, you can pick up both for pretty cheap. 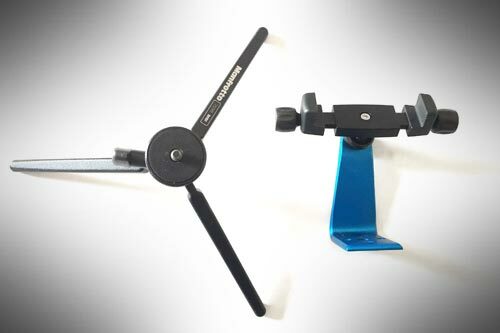 A small backpacking tripod should run you between $25-$50. I personally use the Manfrotto 709B tripod and love it’s adjustability and packability. 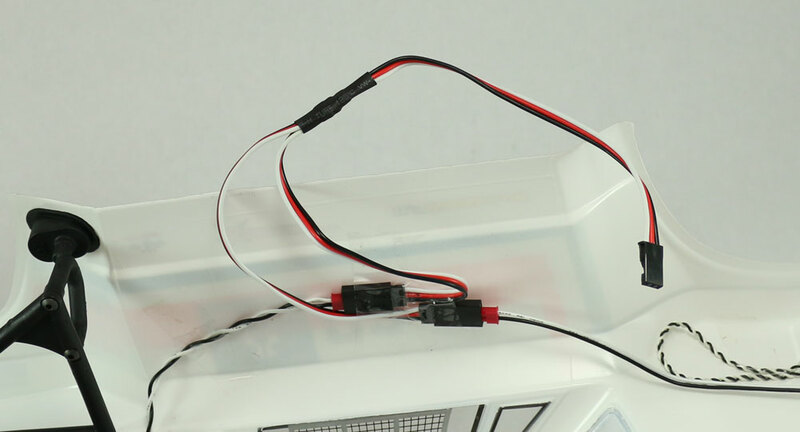 Also, you’ll need a smart phone adaptor which will run around $30. 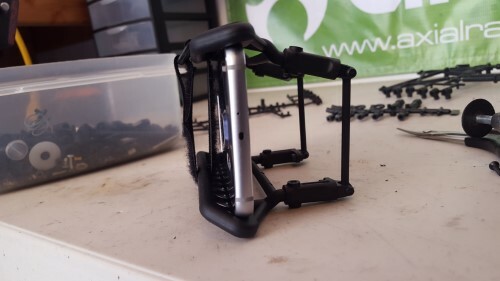 My go to choice is the MeFoto Sidekick 360 phone mount. Now that we’ve covered the basic gear that you’ll need, let’s take a look at some easy techniques to get the best photos possible. 1. 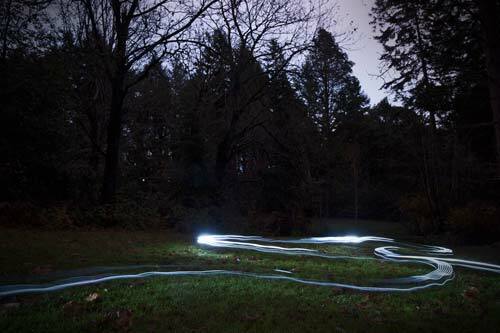 Long exposures: where the lights on your car leave a trail where ever it’s been. 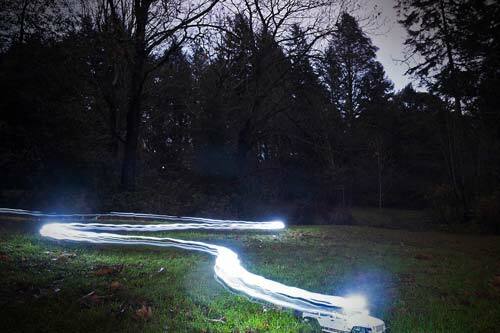 You won’t be able to see the car, but you’ll have streaks of light instead. 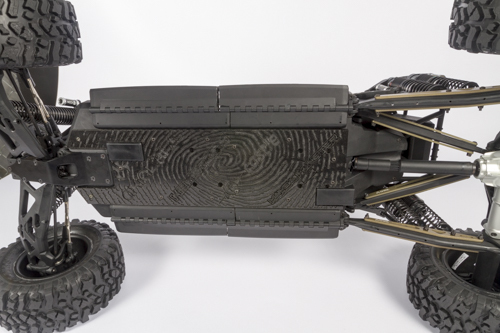 This is great if you’re trying to capture the landscape and get a sense of where you’ve been. 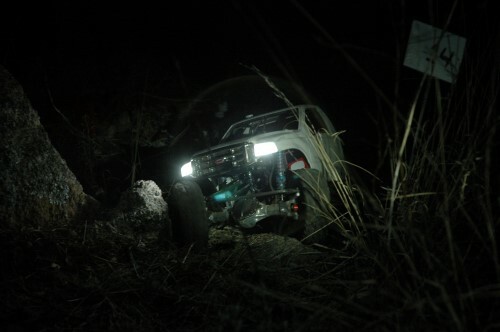 To achieve this, set your phone on your tripod and set your shutter speed to somewhere in the 5-15 seconds window (this will be dictated based on how far you want to capture your RC car moving). Click the shutter and then begin driving. 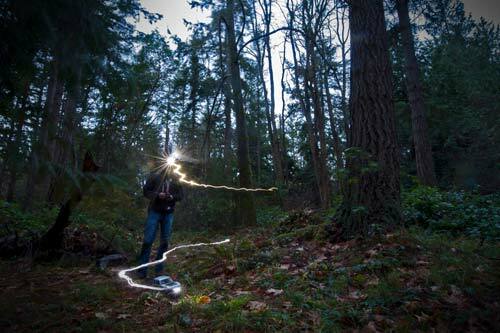 Try not to go straight at your smartphone (as the lights will create lens flare) but instead, go at an angle or across the frame. The further you go and the more turns you make, the more interesting your photo will turn out. 2. 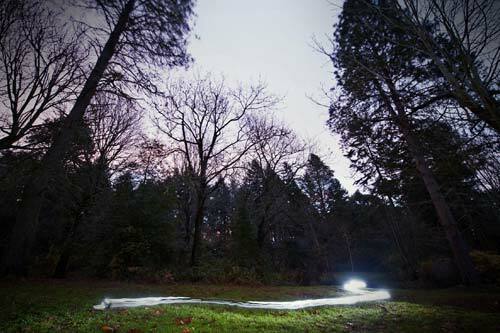 Shorter exposures: where your car is visible and crisp with light streaks behind it. These photos are great for showing the details in your car while also giving the image a sense of movement or speed. These shots are a little more difficult to achieve, but the results can be really fun. 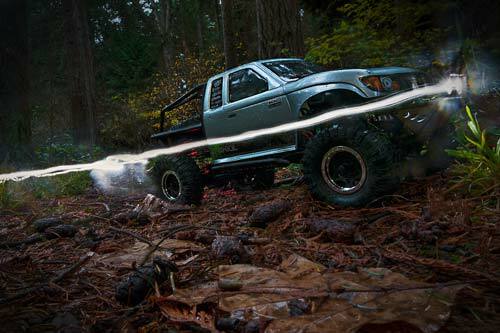 To achieve these types of photos, switch your smartphone app to “light trail” capture mode (assuming you’re using SlowShutter). 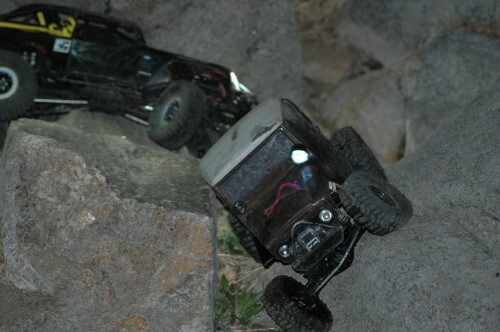 Position your RC car close to your smartphone and frame it up so that it’s at about a 45 degree angle, so you can see the details in the car. Focus your phone on your car, then click the shutter. Here’s where it gets a little tricky. Once you click the shutter, wait for about 5-10 seconds before you do anything. The longer your car sits in one place, the crisper its image will be in the final photo. Once you’ve waited that time, now drive your car in REVERSE, away from the camera. 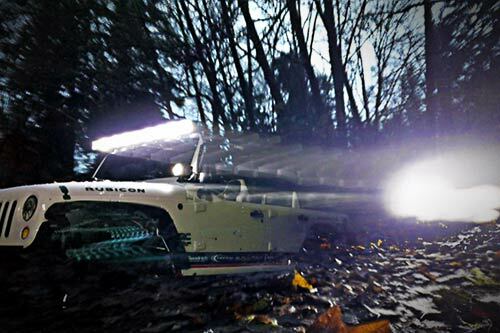 This might sound counter intuitive, but it will create the light streaks that you’re trying to achieve… trust me. 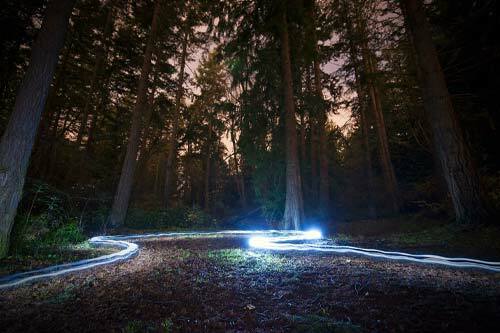 This is a perfect time to add some light painting into your shot (mentioned earlier). 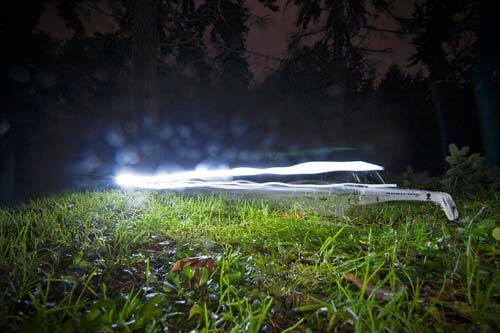 While your car is sitting still for that first 5-10 seconds, shine your flashlight around the car to get more detail into it. 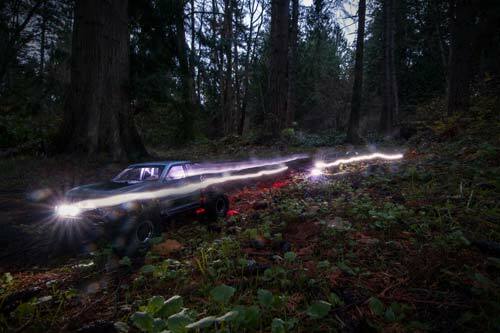 Turn off the flashlight and drive in reverse. 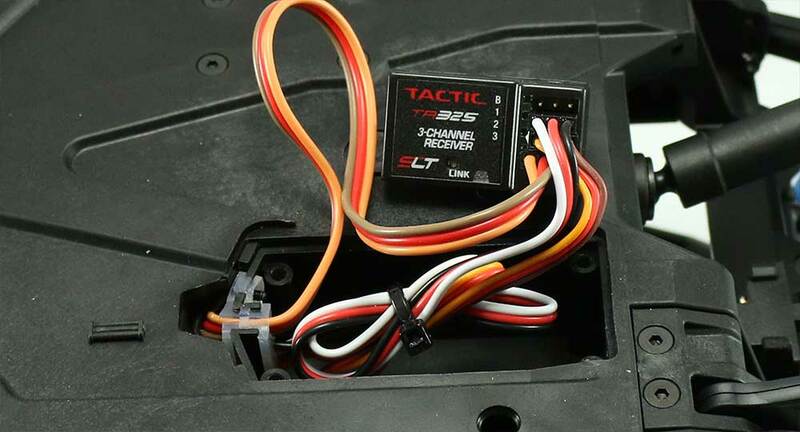 Your car will have more detail this way. Play around with the duration of your shutter speed and how far you place your smartphone from the car to achieve different looks. Also, if you can find hilly terrain to shoot in, even better, as it will add a vertical movement in the frame instead of just left to right. If you’re liking this style of photography but want to move to a higher quality camera than your smartphone, then this next part is for you. 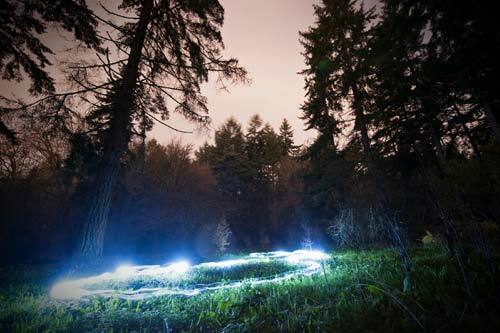 Any camera that has the ability to control shutter speed will work for night photography, but a DSLR is going to be your best bet as it has the most room to control every variable. Other than that, all you need is a tripod. Most of the techniques that I described earlier will work on your DSLR just like they worked on your phone. 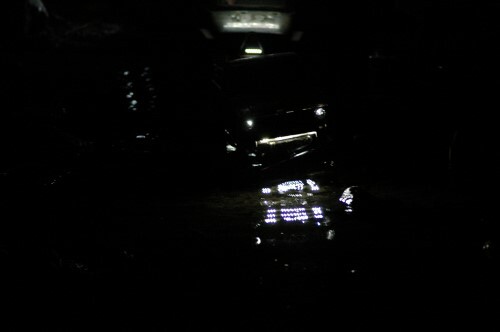 However, the resolution will be better and you’ll have more detail in the dark areas of the frame. 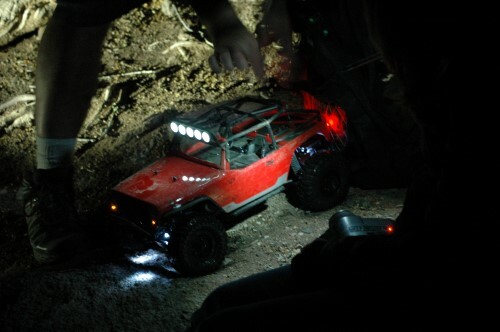 Using this style of shooting will allow you to drive your RC car across the frame and capture the light trails behind it, but with the added bonus of freezing the entire scene (including your RC Car) at the end of the exposure. 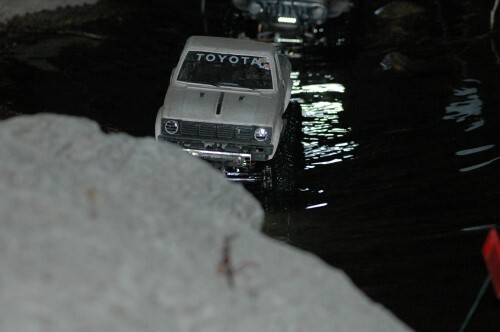 Scenario 2 from our Smartphone example is similar to this, but this technique is much more precise and doesn’t require you to sit still for the first 5-10 seconds… or drive in reverse. Now that you have the basic techniques and the know-how to carry them out, get out there and practice and experiment. At first it will be confusing, but the more you try it, the easier it will become and the better your results will be. 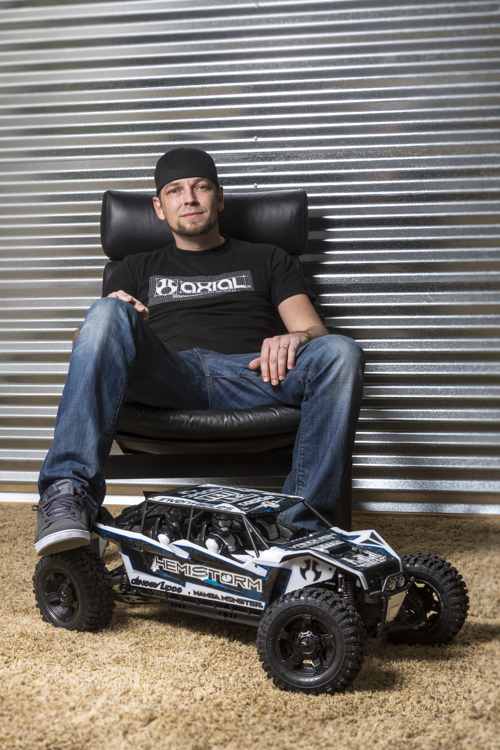 About the Author: Ian Coble is a Commercial Sports Photographer specializing in Action Sports. He’s been shooting professionally for 12 years and has worked with some of the worlds best athletes for clients like Red Bull, ESPN, REI, K2, Eddie Bauer, North Face, Oakley and many, many others. 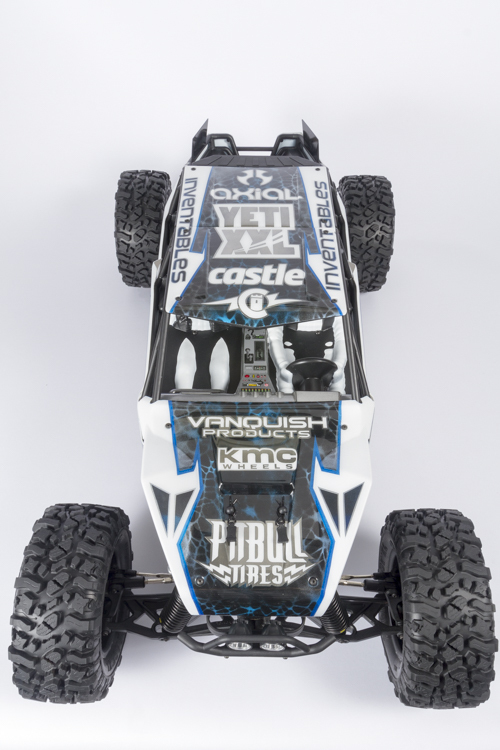 While RC cars might not seem like they have a lot in common with action sports, the camera techniques used are very similar. 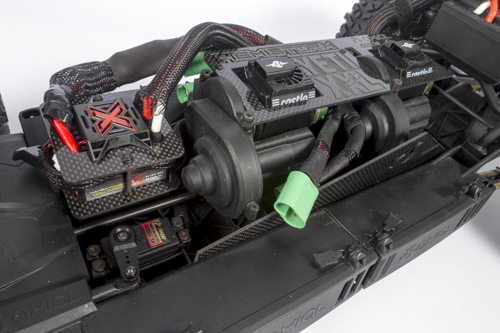 As an RC fan, Ian was stoked to work on this blog post with Axial to share some of his tips. Check out his website at www.iancoble.com if you’d like to see more of his work. 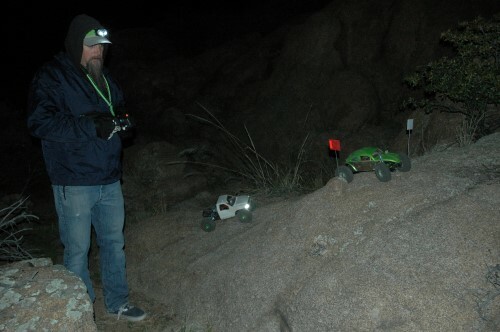 There is no question, scale R/C lovers have an affinity for the outdoors. 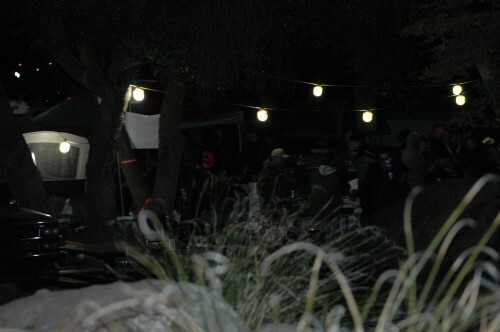 Camping, fishing, biking, the list goes on, the bottom line is we get out there and enjoy nature. 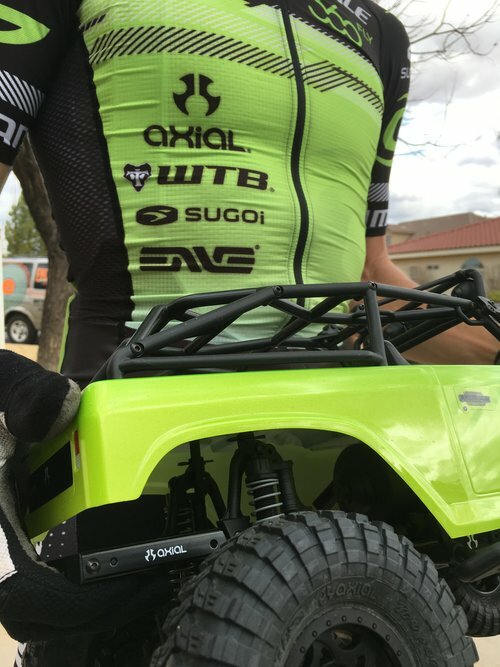 Axial has been working with Cannondale and WTB athletes on various events and trips over the past few years and that relationship has blossomed into a rad new announcement; Axial is now a key partner of the new Cannondale – 360Fly elite Mountain Bike team. 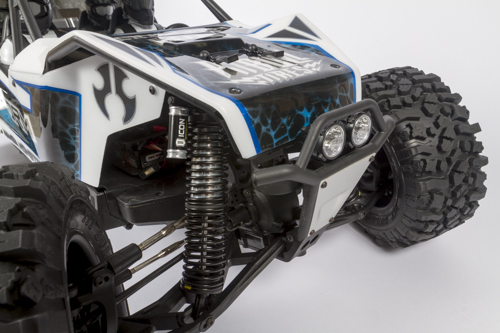 As the official sponsor of “off the bike activity,” the race vehicle and riders will be stocked with a fleet of SCX10s to enjoy between their MTB racing. 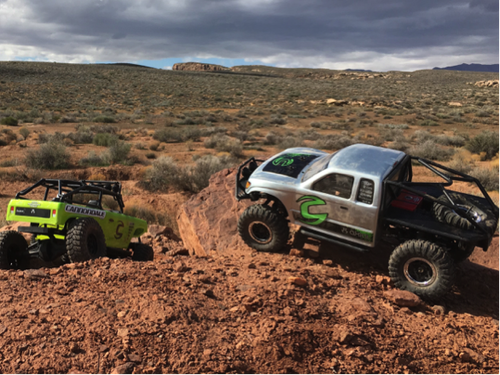 Always looking to spread the scale love, the Axial crew stopped by the team camp in St. George, Utah to meet the riders and take them on a crawler adventure in the incredible desert terrain. 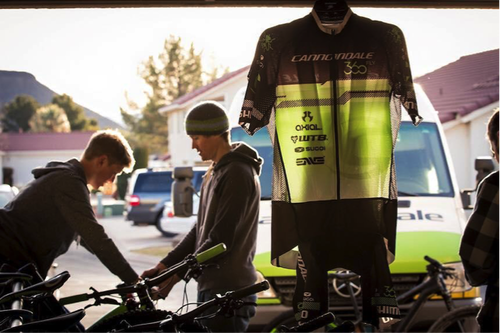 The Cannondale – 360Fly team is made up of 5 North Americans, the 4 Americans; Evelyn Dong, Alex Grant, Keegan Swenson and Tinker Juarez and the current Canadian National Champion, Raphael Gagne. All you OG BMX fans may recognize this guy, Mr. Tinker Juarez. After shredding BMX tracks for years, his prowess earned him a spot in the ABA Hall of Fame and groomed him for a 2nd racing career in distance Mountain Biking. 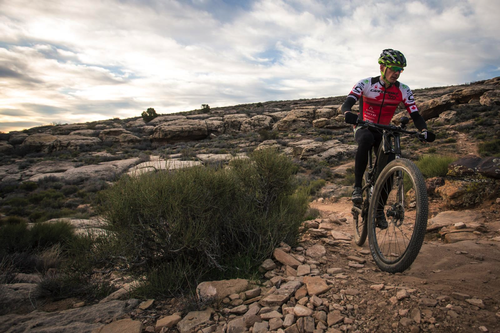 At age 55, the National Champion and Olympic athlete hasn’t slowed down at all, still taking podiums away from young guns on any given weekend. 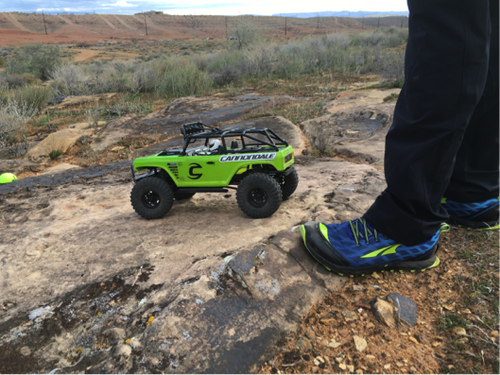 Tinker was super excited when he heard Axial was a sponsor and is looking forward to spending time off the bike scale crawling with his son. 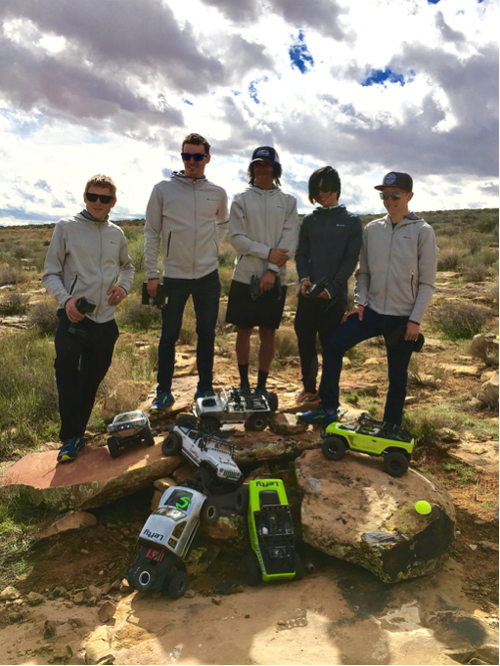 Keegan Swenson was part of the posse on a MTB/Crawler video trip with Cannondale Athletes and Axial last fall and has been hooked ever since. 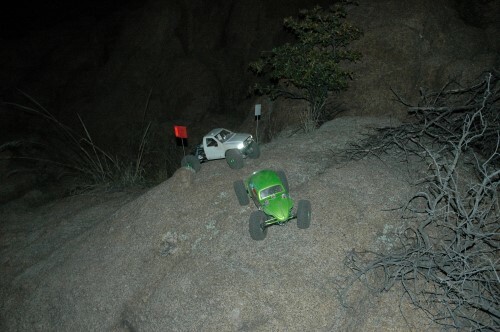 When he isn’t training to add another National Championship jersey to his wall, the 22 year old has been spending his days crawling his Deadbolt SCX10 all over Utah, Colorado, and California. 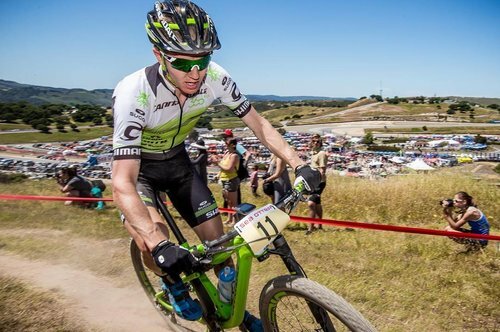 He has already graced the podium once already this year and is one of the bright young stars of US Cross Country MTB. 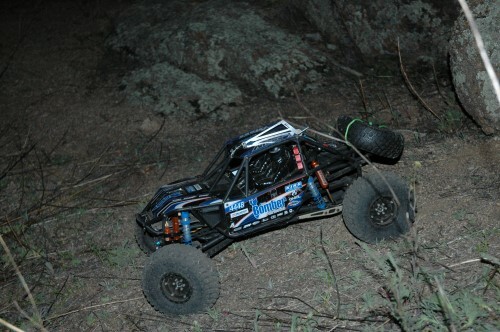 Alex Grant was introduced to scale crawling this summer after the Cannondale Sales Meeting (http://www.axialracing.com/blog_posts/1073911789) and spent the summer crawling all over Southern Utah. 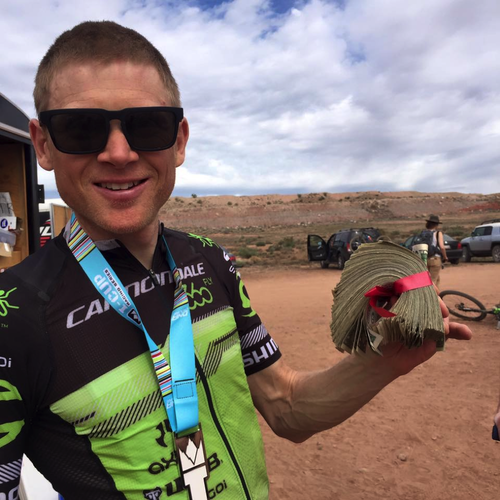 He has started the season with incredible fitness already taking two wins, including the Fat Bike National Championship. Evelyn Dong may be the only female on the team but she has a track record of putting guys (and fellow lady competitors) in the hurt locker as she blasts race courses across the US. 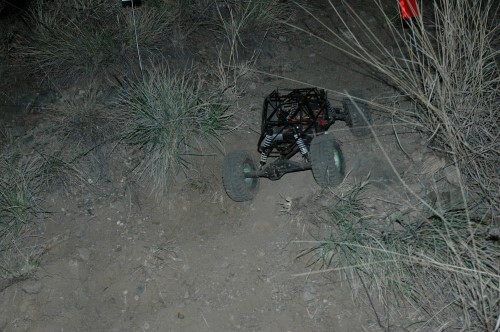 Team camp was her first experience with RC crawling and just like she races, she mashes the throttle! After some big results in her last two years of racing, look for Evelyn to be on the podium all season long. 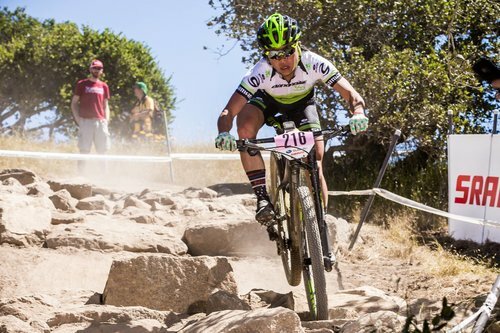 Raphael Gagne was arguably the hottest thing in North American mountain biking last year, basically winning or gracing the podium in almost every race he entered. He will take that momentum and his fresh Canadian National Champion jersey back on the road this year to defend his multiple titles. 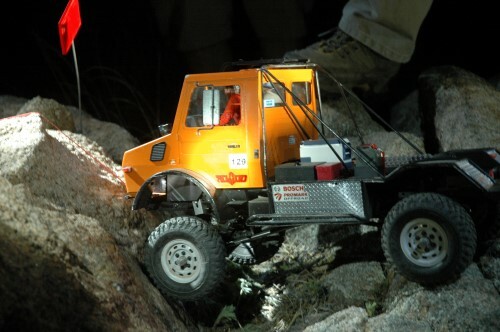 Raphael is new to crawling and we are excited to see what kind of terrain he gets into as he crawls all over Canada. 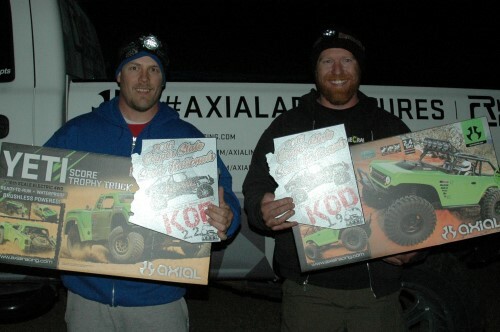 Altra shoes are the official casual and training shoe of the team and are the Title Sponsor for the Ultra event at AXIALFEST 2016 this July in Cisco Grove, California. 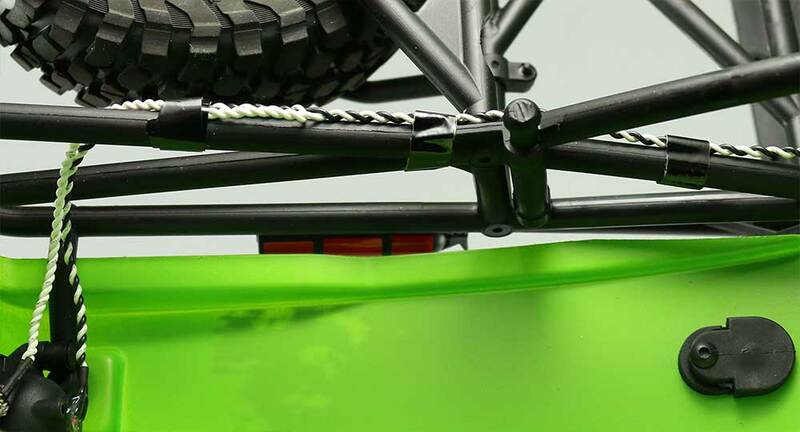 Cannondale – we pride ourselves in making the most kickass, cutting edge frames in cycling. 360FLY - Design and create 360° cameras and technology that inspire people to capture, share and experience their lives in immersive, interactive 360° video. Our passion and unrelenting pursuit of innovation have led us to redefine what is possible in video, virtual reality and visual storytelling. SUGOI – Since 1987, Bred in British Columbia, Canada from towering granite peaks and verdant coastal rain forests, SUGOI’s designs and creates performance apparel that doesn’t just meet high standards, it sets them. Altra Shoes: The official casual and podium shoe. It’s Saturday evening and I am in Prescott, Arizona at Watson Lake. 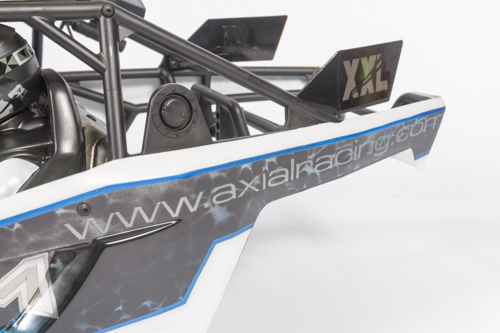 I am here for the King of the Dells sponsored by Axial Racing. It’s dark out and there is not a lot of lighting around here. You can see just how dark it is. 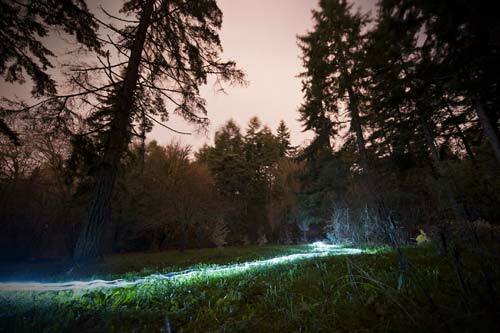 Lights are not just a scale item on this run; they will help navigate you through whatever lies ahead. 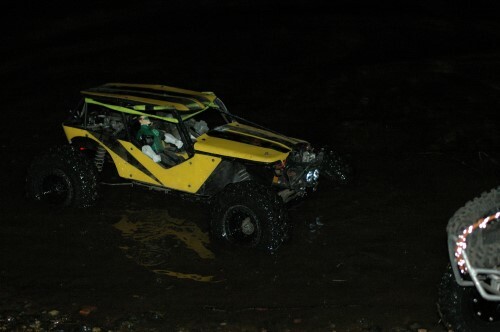 If you have never done a night run you’re missing out on a real adventure. Even if you have run the trail before, the cover of night changes everything. 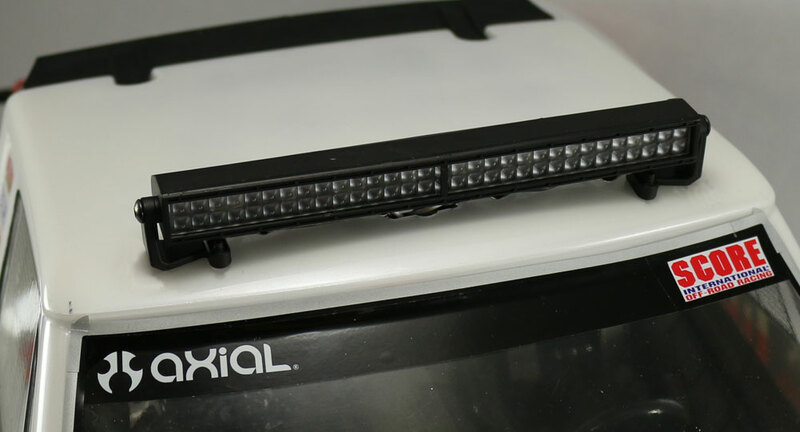 Look how much differently headlights light up compared to an overhead light bar. 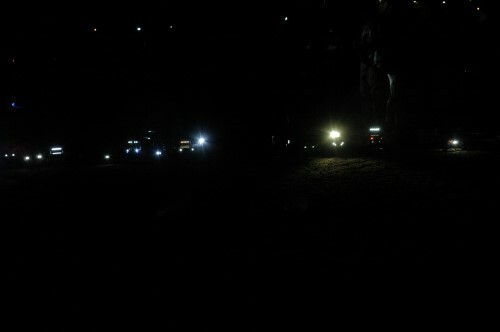 After a drivers meeting these drivers were off into the darkness. 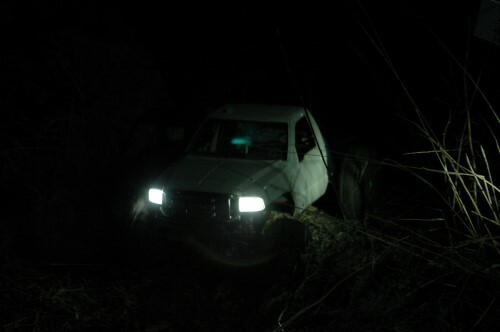 Just to add a degree of difficulty, these guys had to drive some gates in reverse. 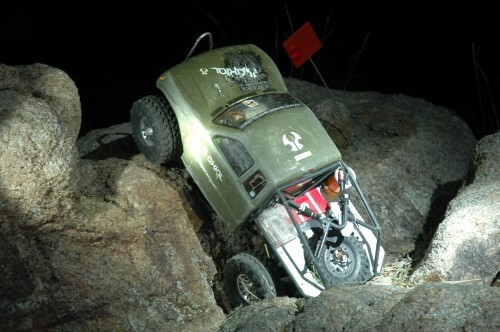 An ordinary rock can hold you up for a minute if you have to do it in reverse. 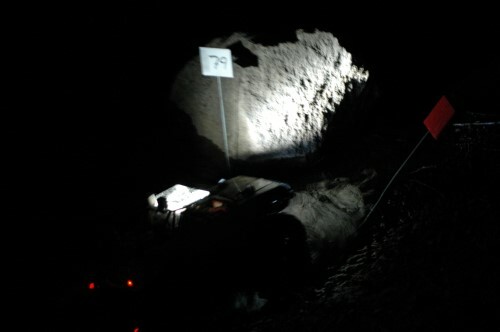 This Honcho was getting some spot lighting by the drivers with headlamps. 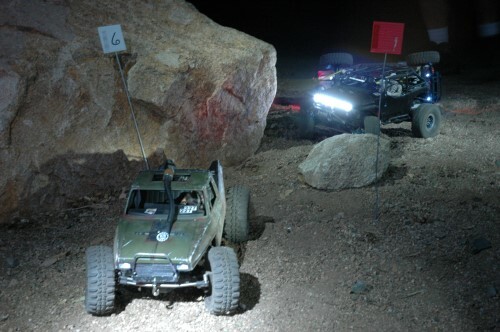 Some did not have them, making some obstacles tough. 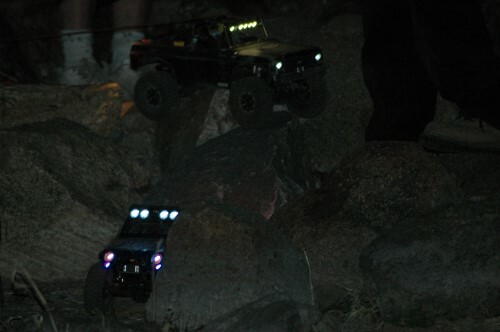 Some drivers broke away from the pack, keep in mind I am using a flash on some of these pics. 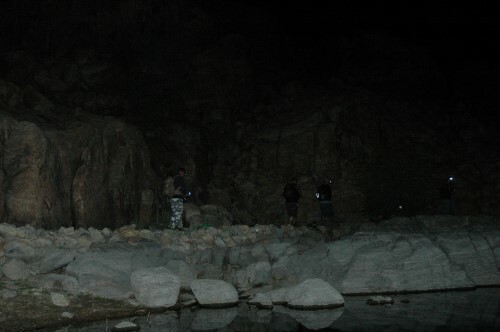 So these guys were on their own under the cover of darkness. Lots of guys are really helping each other out. That’s what it’s all about right? Having fun and helping out. 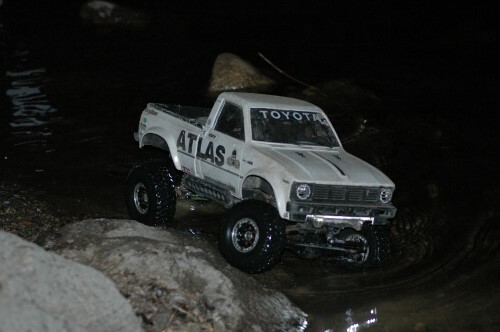 It’s always cool to see the Axial Bomber out on trails. No flash used to take this pic, so you’re seeing what the driver has to work with. 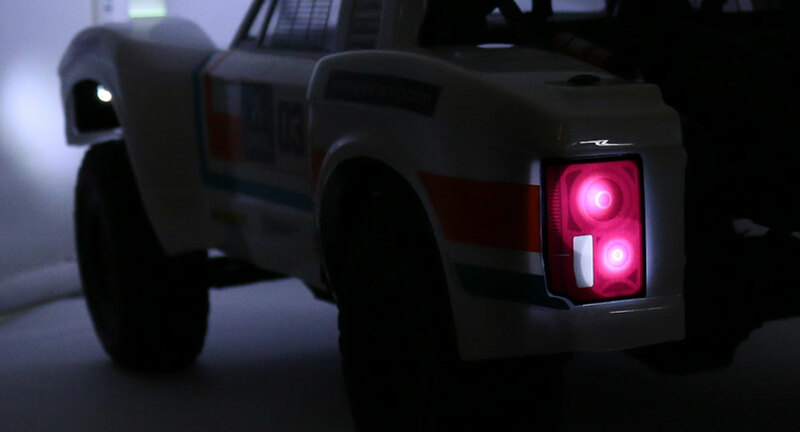 The Subaru Brat is cool and seems to be holding it’s own. 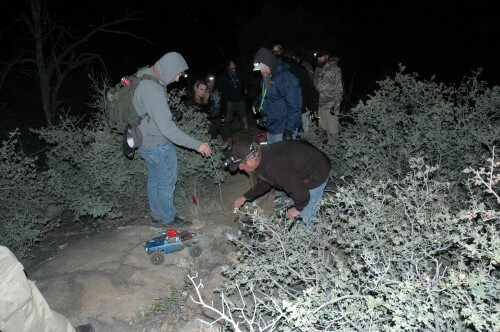 A few breaks on the trail, but most seemed well prepared. 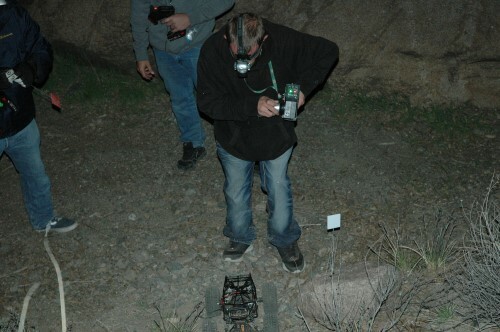 Like Ikaika Farrior Owner of the The Crawl Space in Colorado. 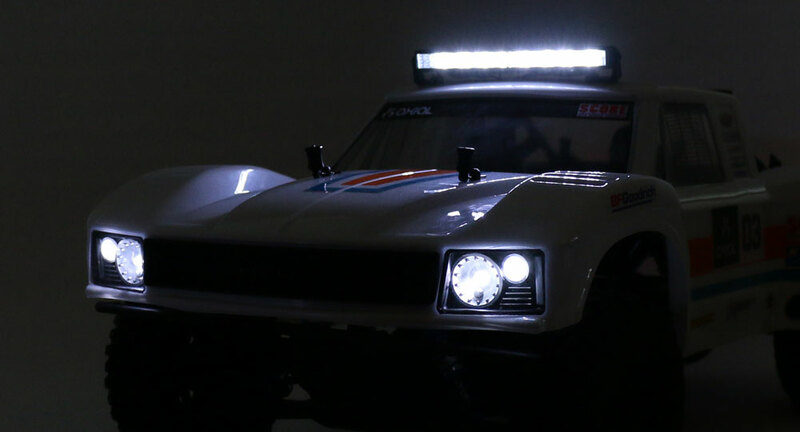 Could you drive an entire course with just the lights on your rig? 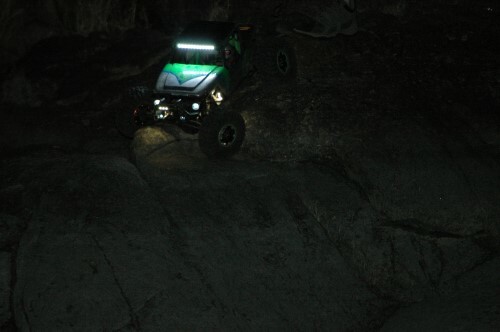 At times I was walking the trail looking for cool spots to post up and wait for pics. You can see beyond the flash it’s pitch black. Hmmm. 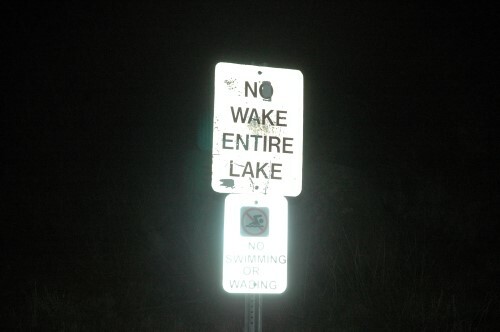 I am coming up on the lake, some water shots may be cool. 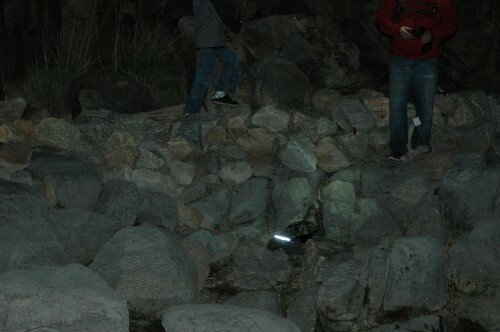 You must navigate this rock garden before getting down to the water. 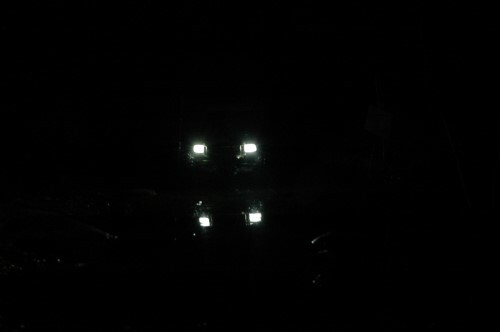 This driver is running solo with just his headlights. 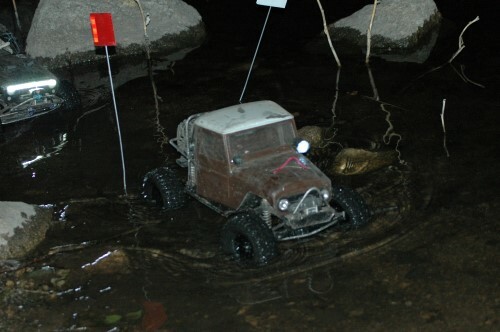 He is now in the water section. 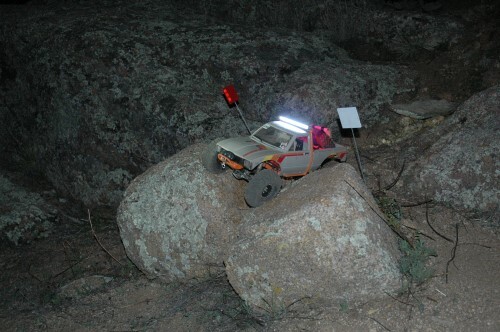 This pic should illustrate how rock lights can help you with visibility. 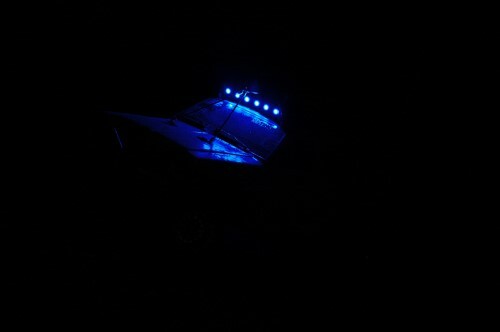 The blue lights were cool. I am not sure if they are better than bright white on this particular run. 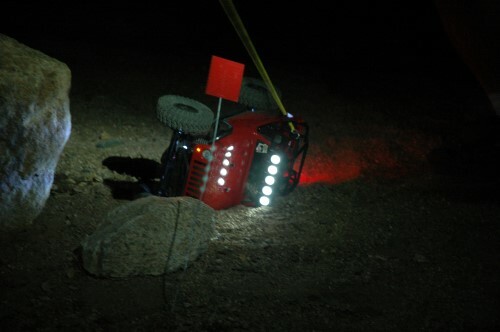 The shot above is with no flash, how the drivers are actually seeing the course. 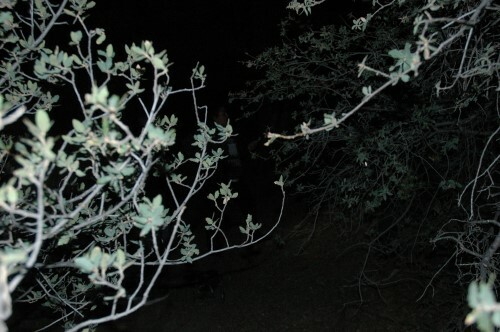 Below is with my flash, taken a second later. 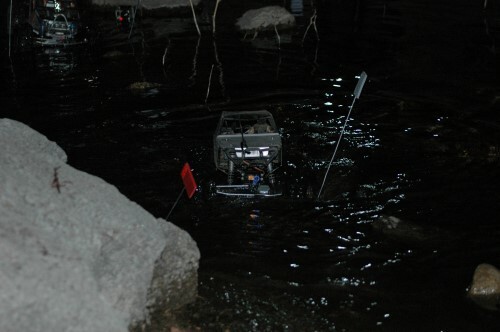 Placing a GoPro in the water could be a cool shot if it can pick the trucks up. 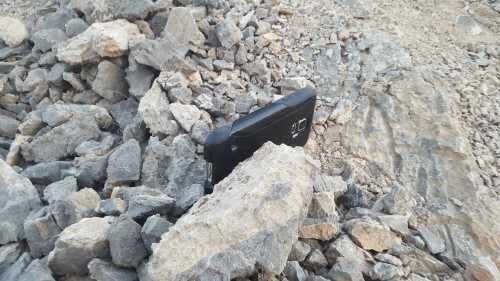 Do you try and film or take pics on your adventures? 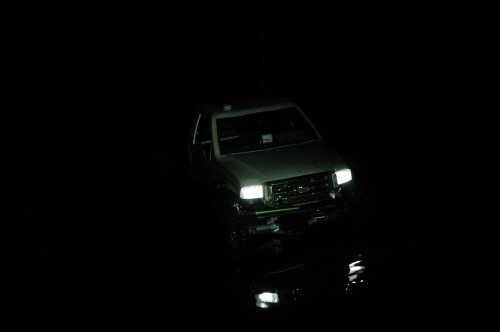 No lights! 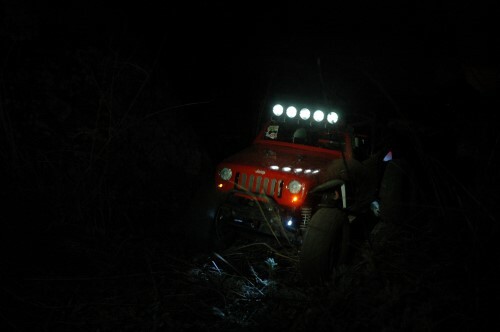 That’s a tough one, have a good head lamp or friends with lights. 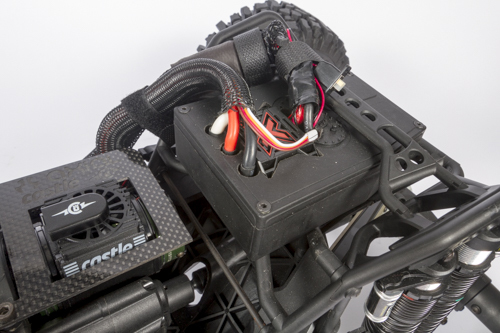 This is a really cool looking build. 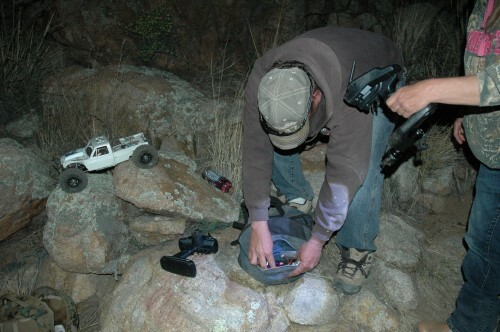 Putting a light on your radio is always a popular choice too. 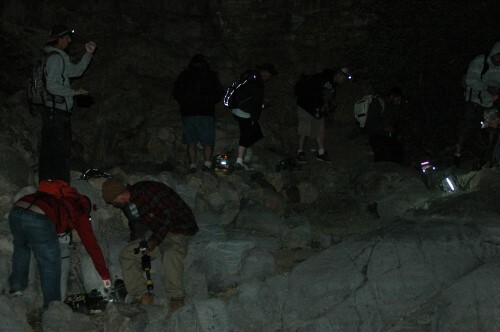 I came across this group trying to navigate the rocks. 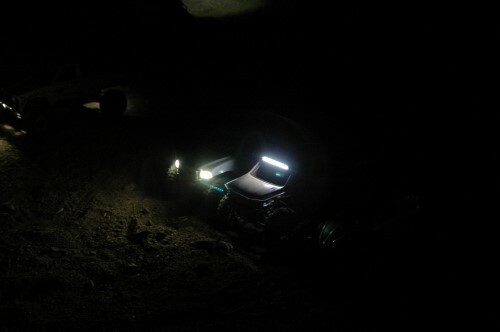 Doing this at night is a truly unique experience. 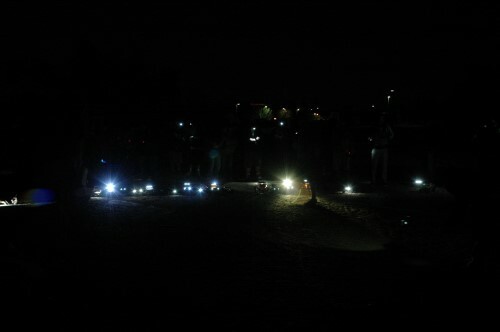 Maybe try a small night run with friends if you have never experienced it. One spot light is better than having no lights right? 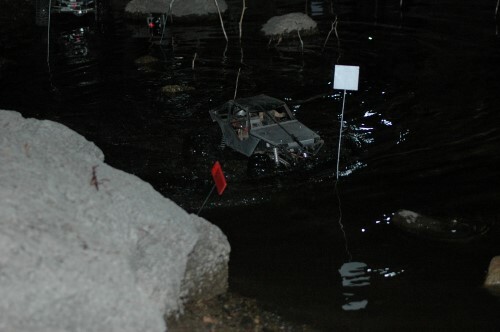 I watched a few of the last guys navigate the water. 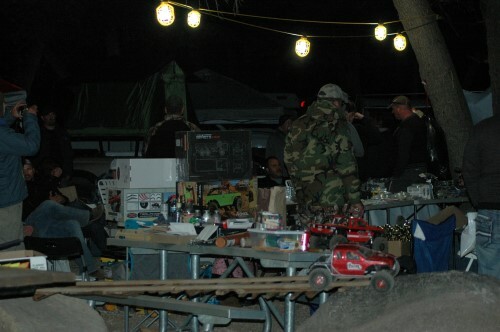 It’s getting late so I am going to head back to camp. 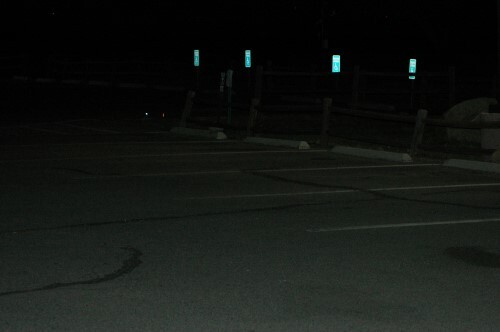 Its kind of an eerie feeling walking alone in the dark with no lights visible. It’s all part of the experience. 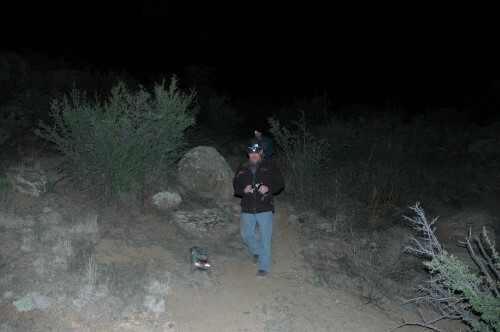 I came across a few people off in the bushes still navigating the trail. 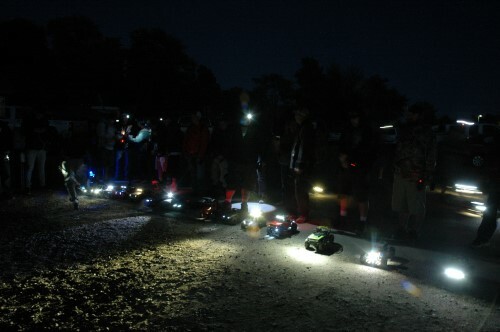 The lights of camp! It’s a feeling of accomplishment when you make it back. With a lot of the drivers back, I am thinking awards will be soon. Its already 10 pm and a bit chilly. Wow! 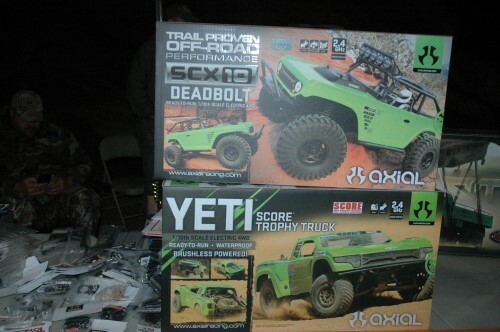 1st place drivers in 1.9 and 2.2 will be taking home either an Axial Deadbolt or the Axial Yeti Score Trophy Truck. 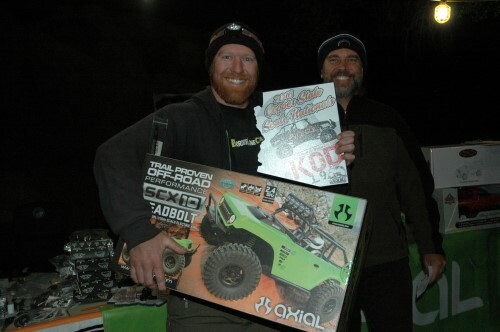 Jake Wright of Hesperia, California taking home the Axial Deadbolt and 1.9 win. Jake is no stranger to podium finishes. 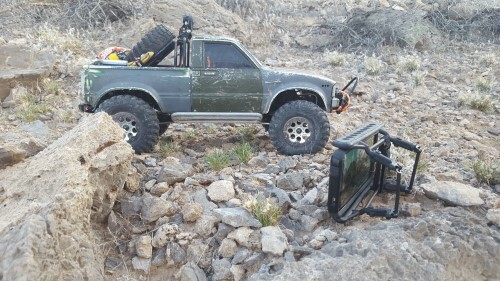 The funny thing about this is he was just talking to me about needing to build a new 1.9 rig. 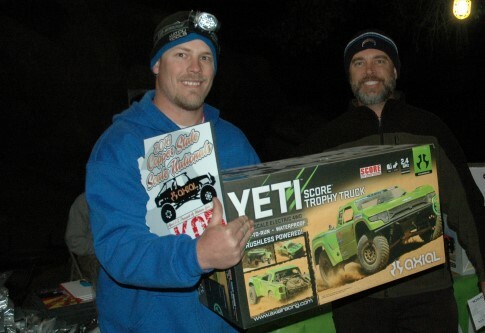 Gary Floridia of Albuquerque, New Mexico taking home 1st place for 2.2 class and the Axial Yeti Score Trophy Truck. I am sure this trip was well worth it! No need to ask how these two feel about the win, their smiles say it best. It’s always a good time when you can go home with a cool story and a great experience.